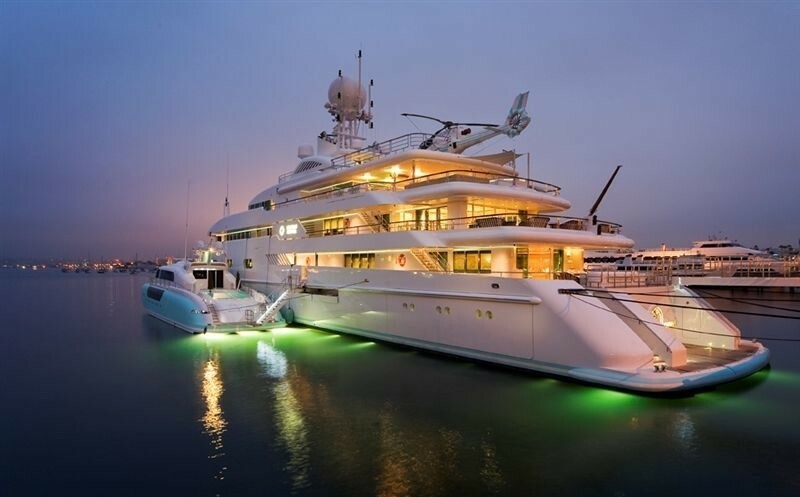 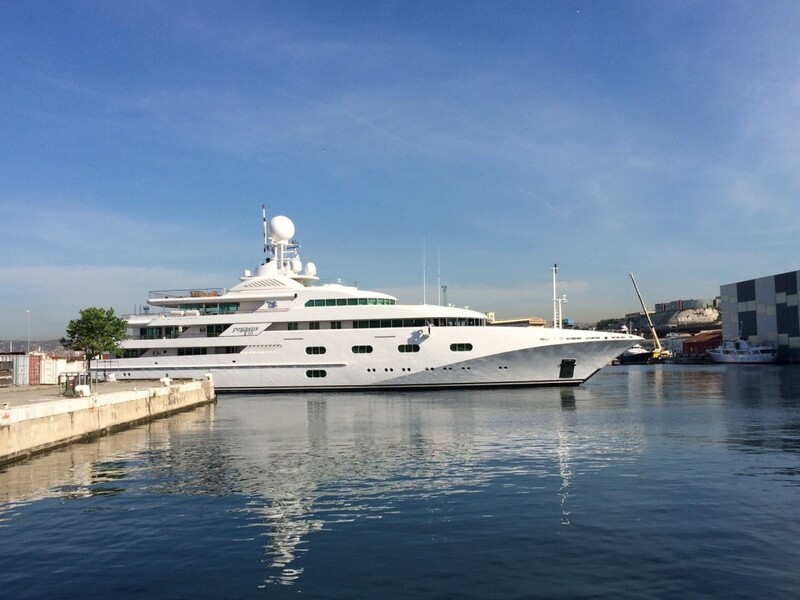 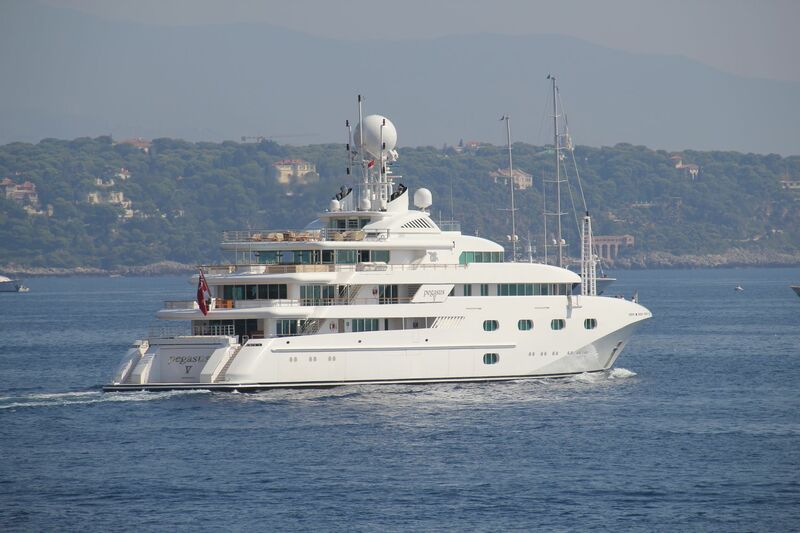 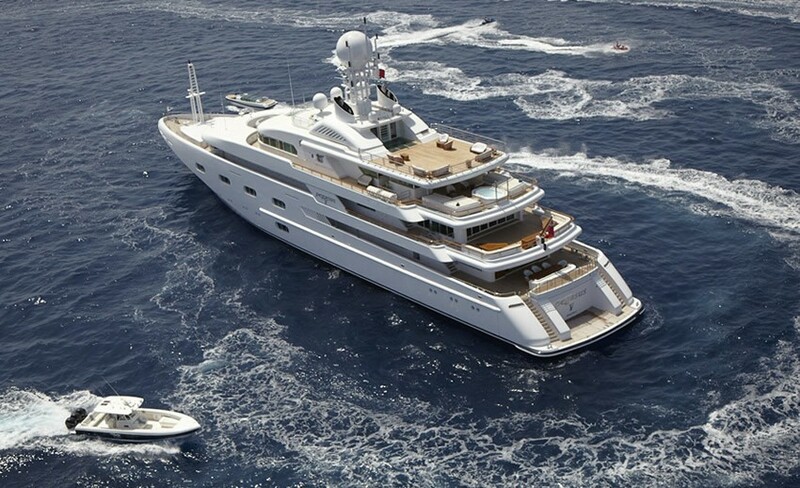 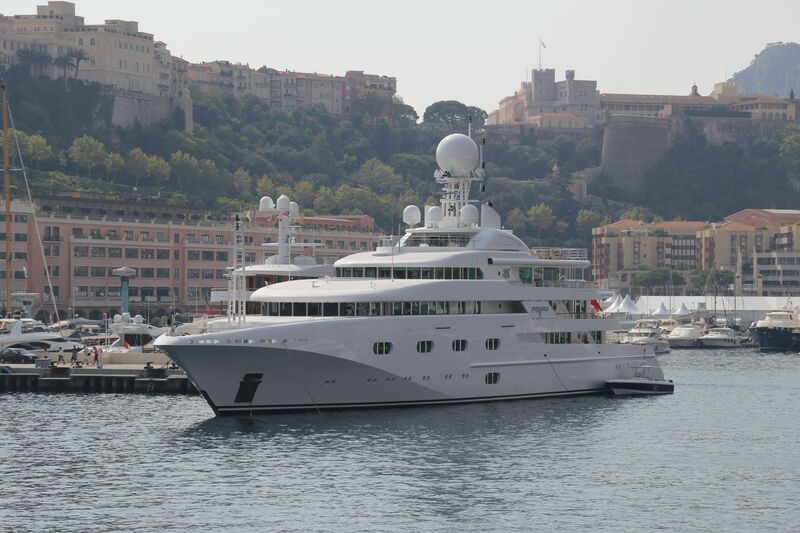 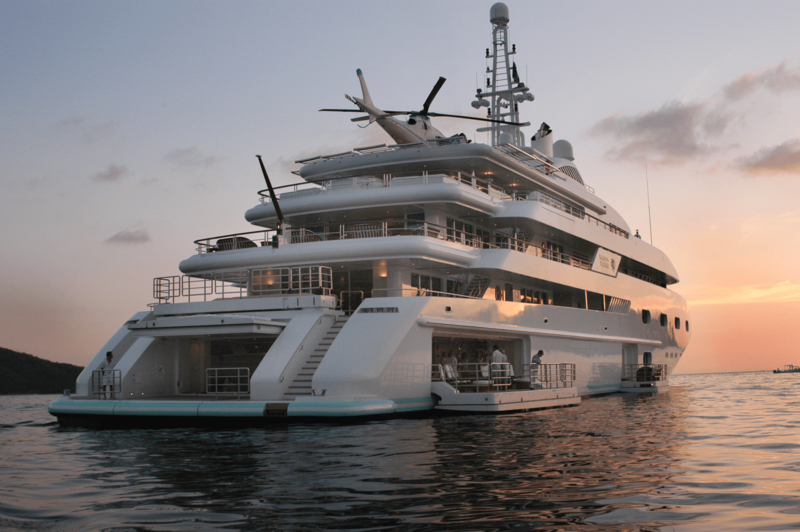 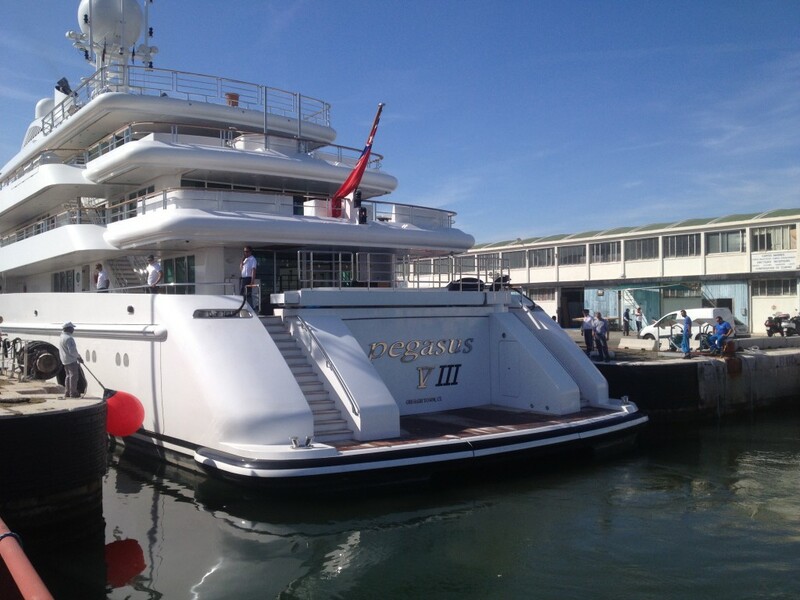 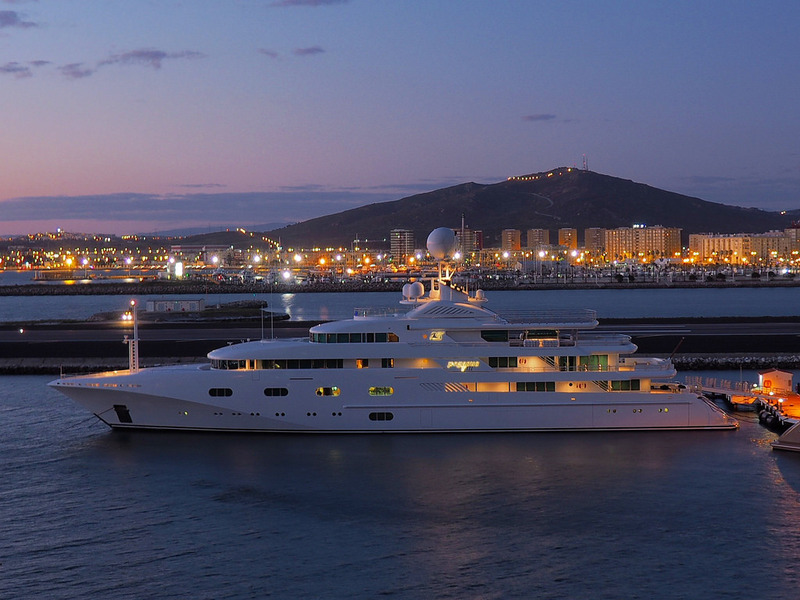 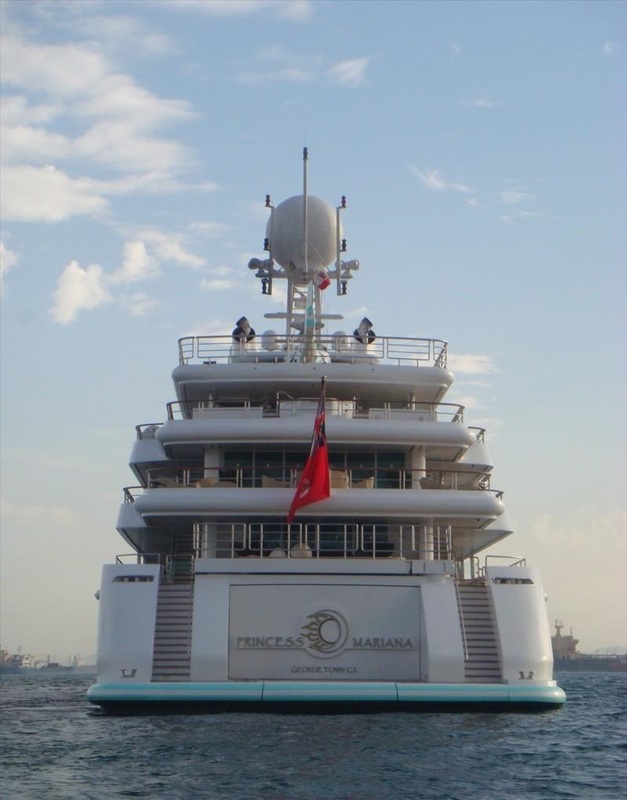 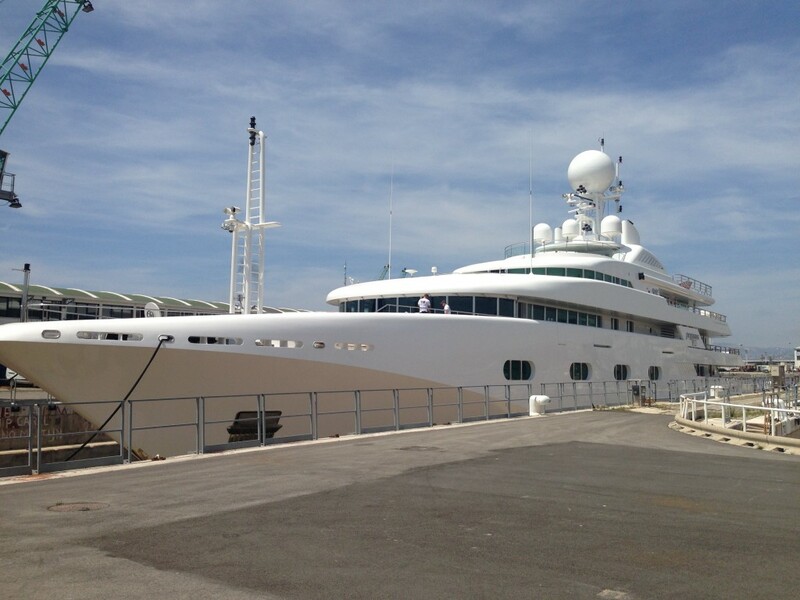 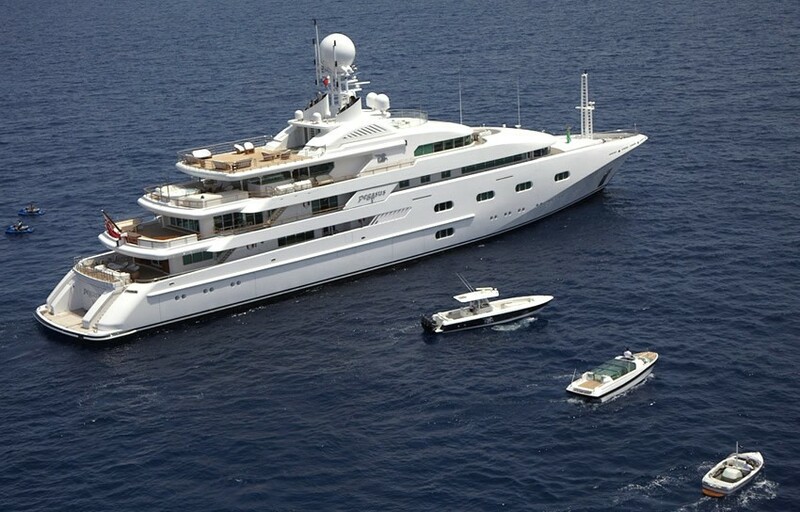 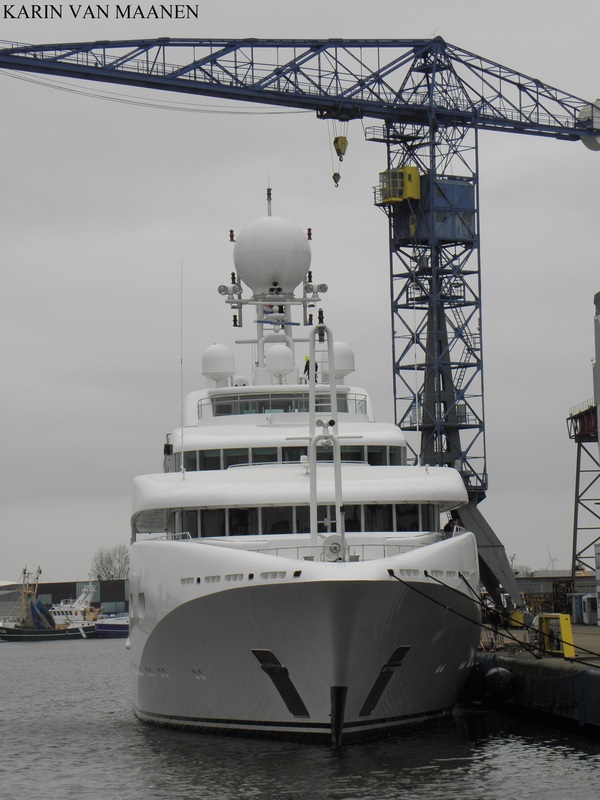 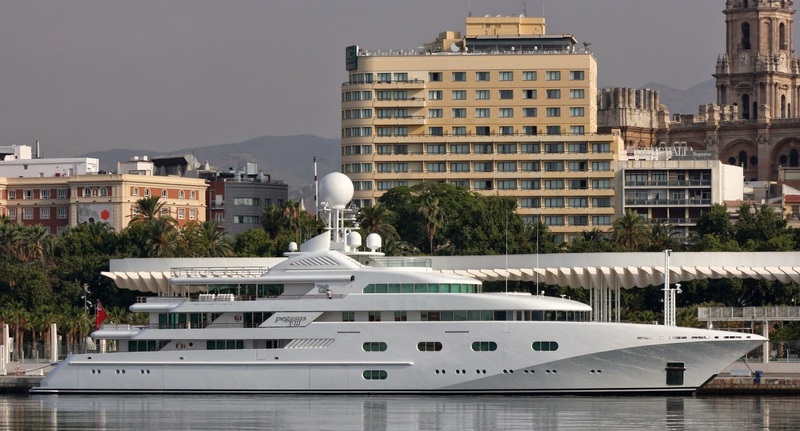 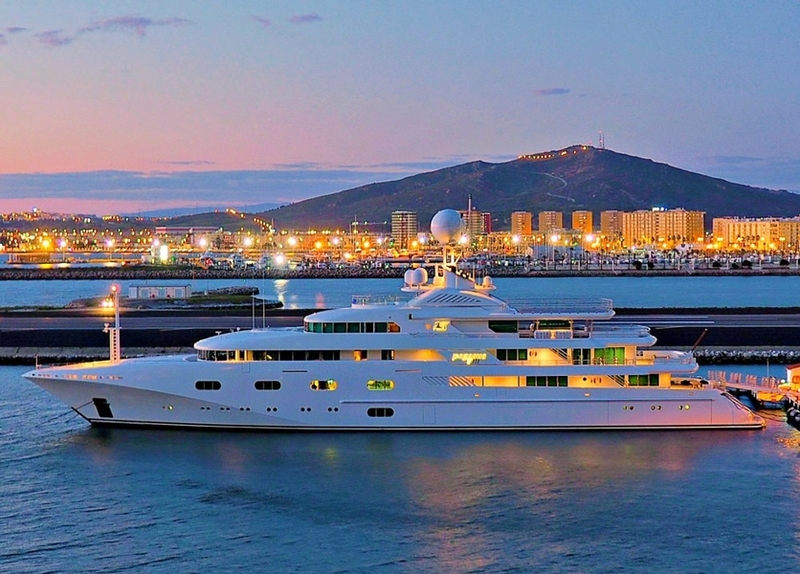 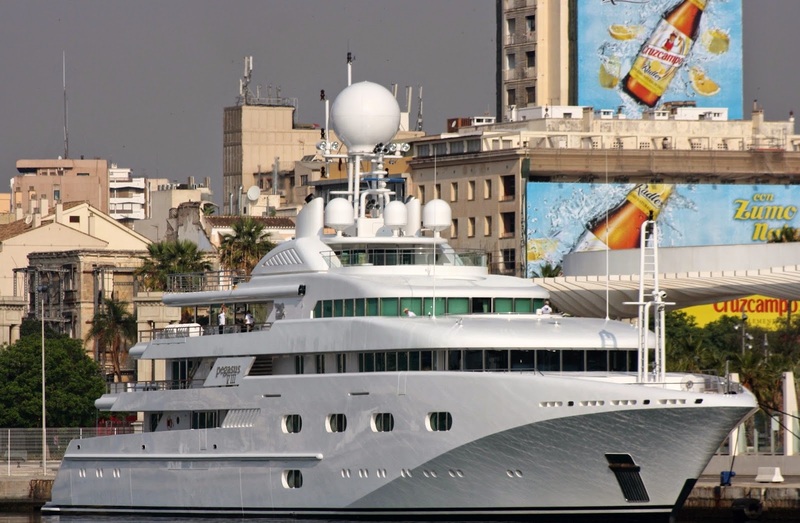 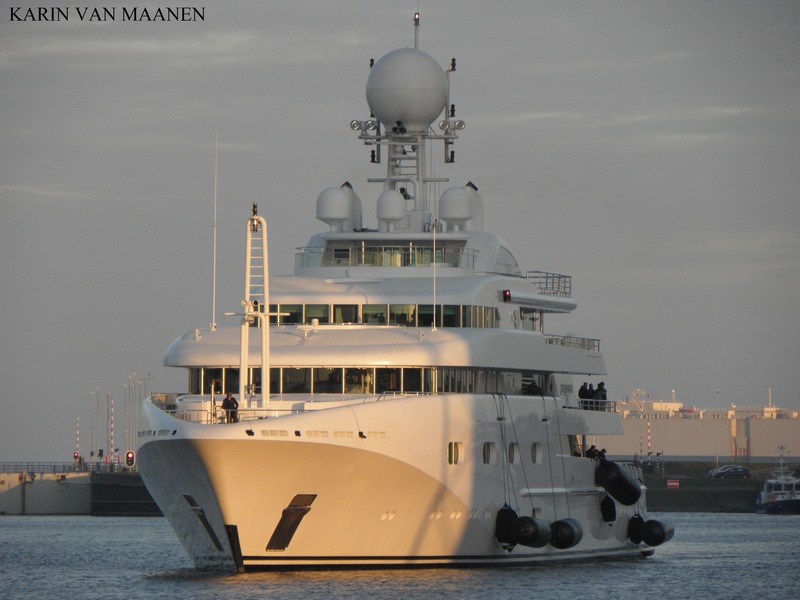 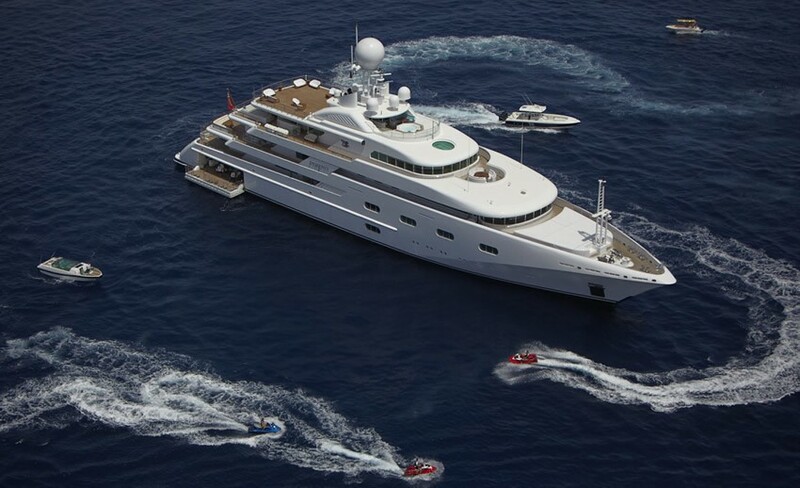 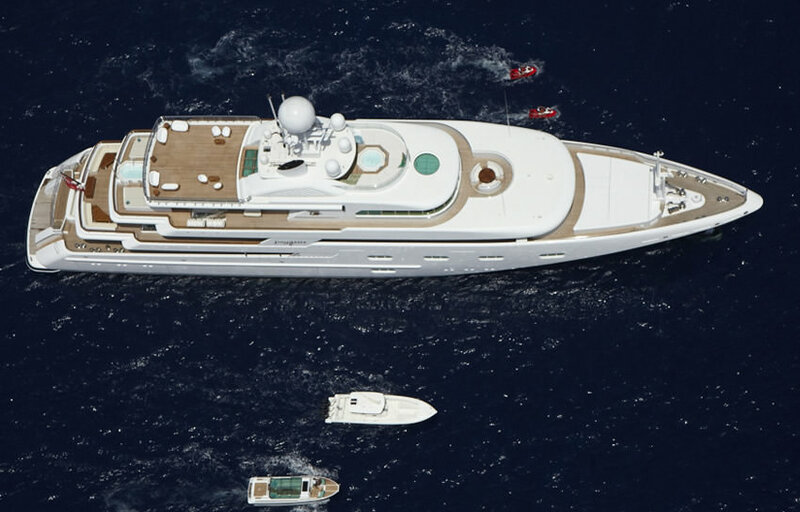 A 78m formidable superyacht in size, quality and design. 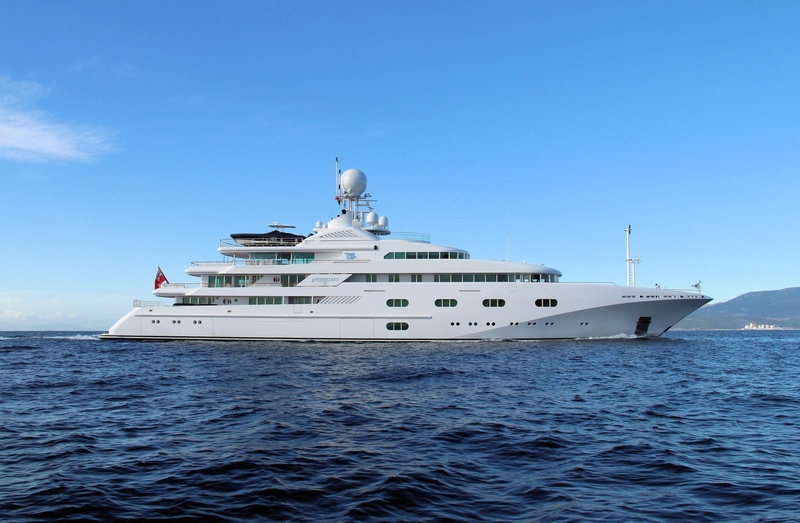 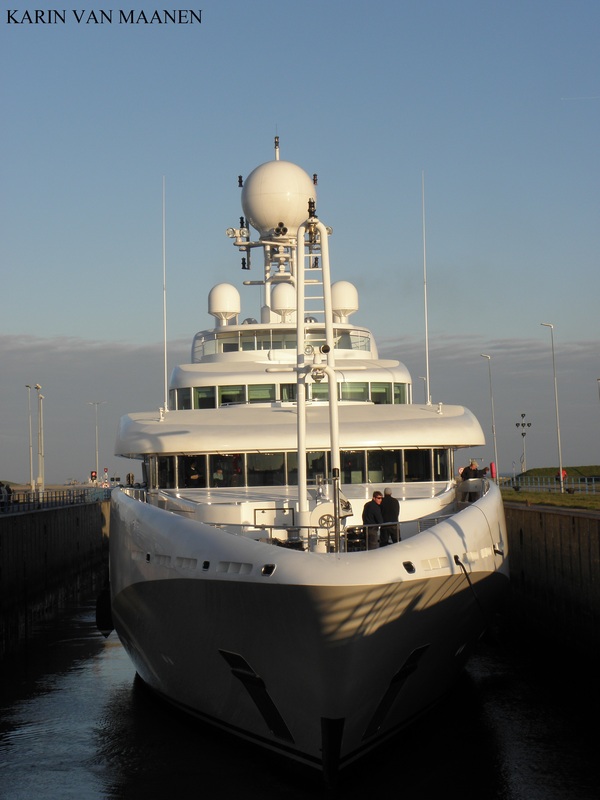 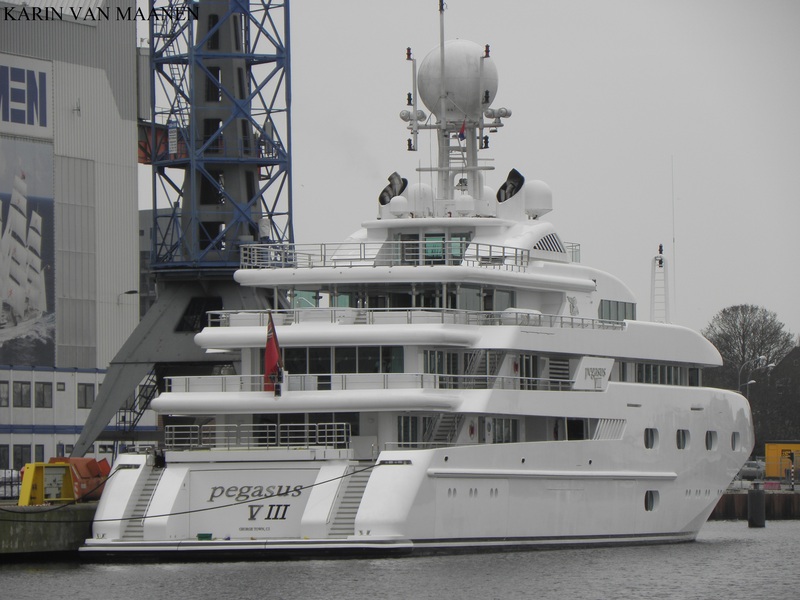 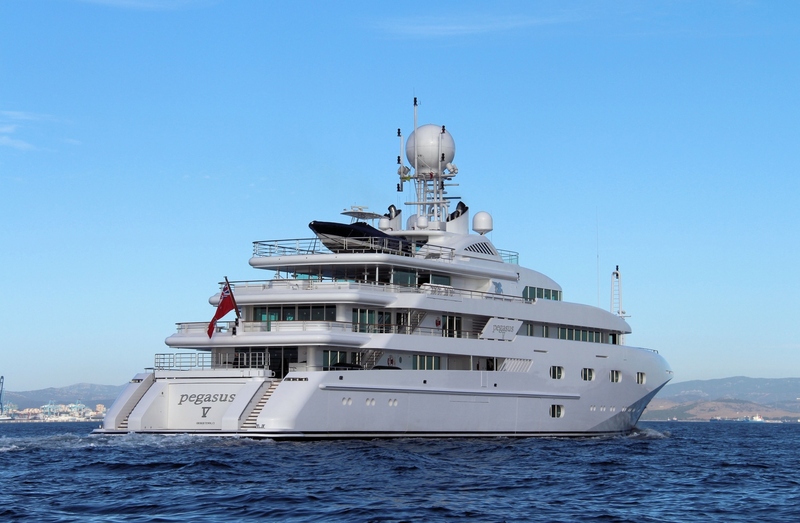 Luxury Motor Yacht PEGASUS VIII (ex PEGASUS V, PRINCESS MARIANA) was built in 2003 in the Danyard Aalborg in Denmark. 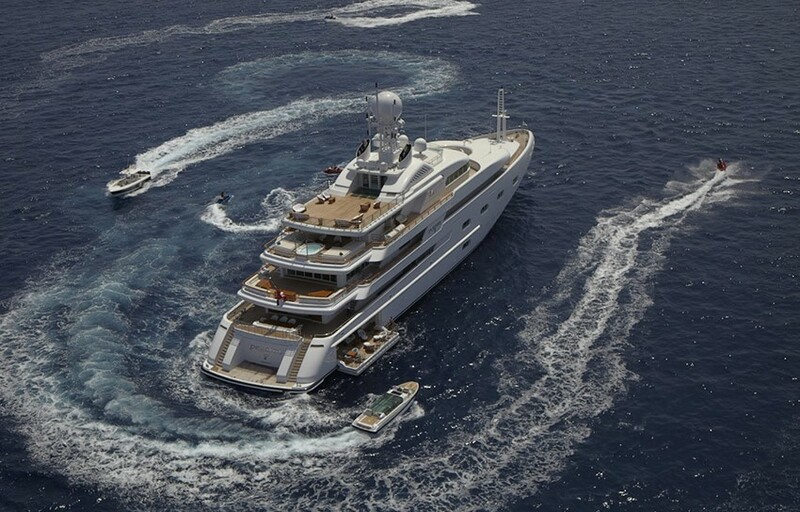 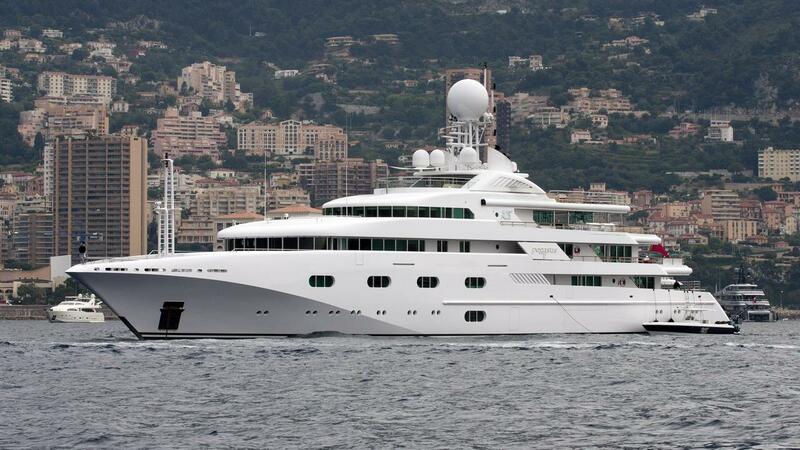 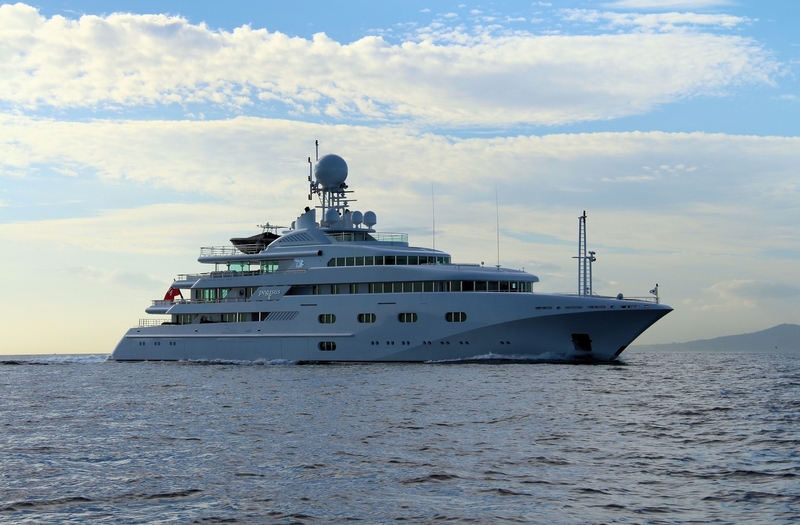 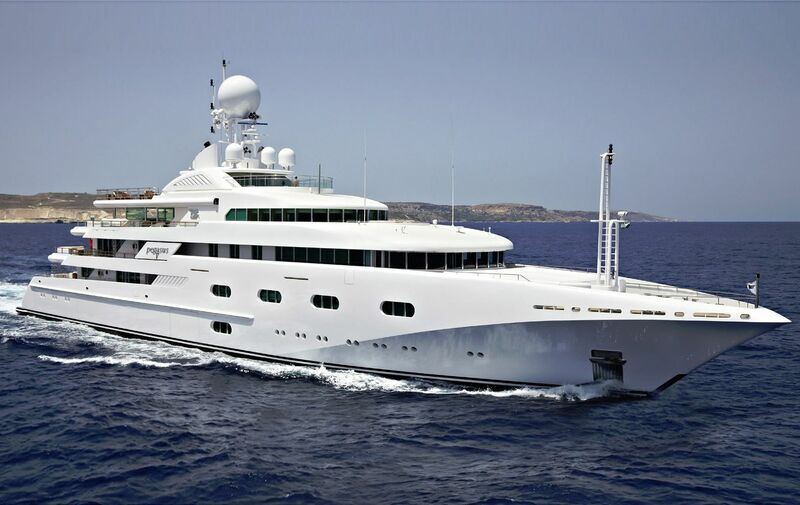 She is a 258 ft superyacht which has six decks – the naval architect is Espen Oeino Naval Architects and the interior designer is Francois Zuretti. 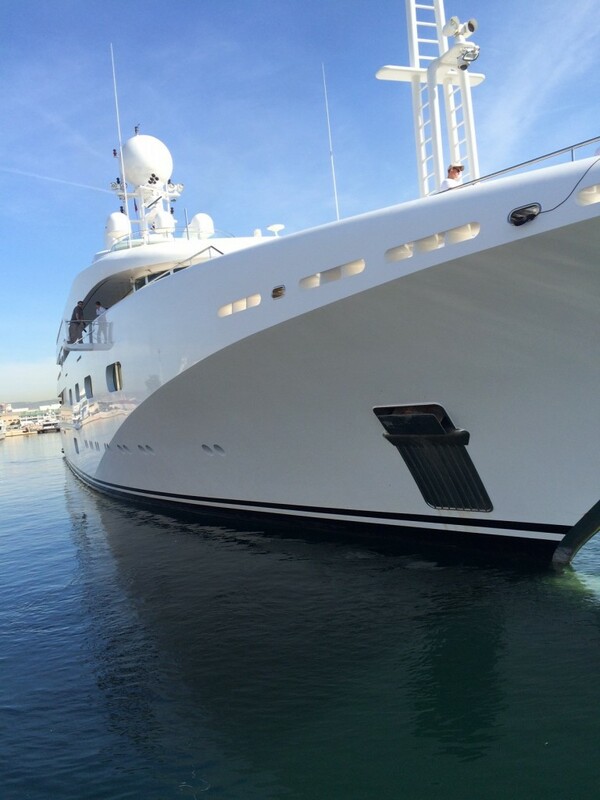 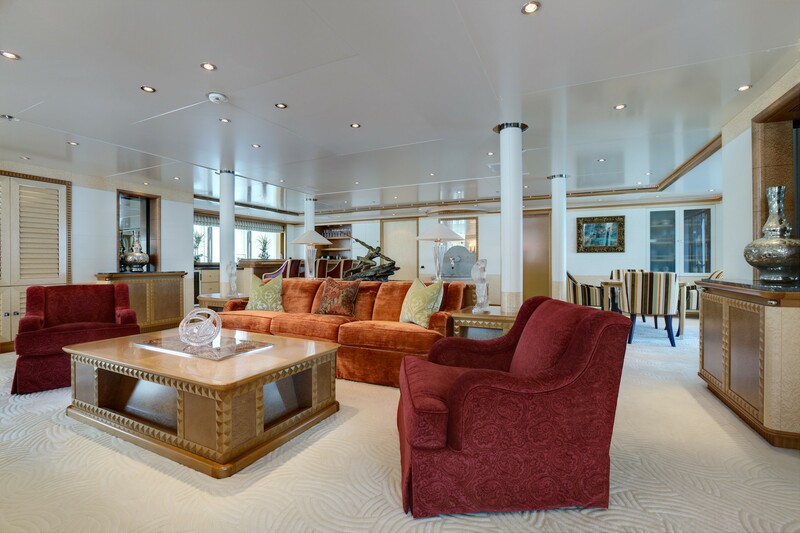 This modern and stylish yacht has been refitted in 2011, is full of modern innovative features, has an impressive six decks, and can accommodate 12 permanent guests on board. 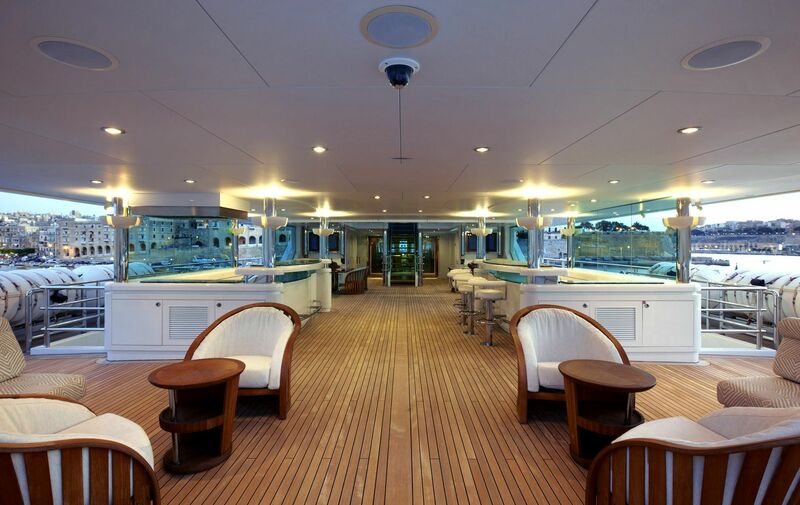 One of the most impressive features on board PEGASUS VIII is the Beach Club. 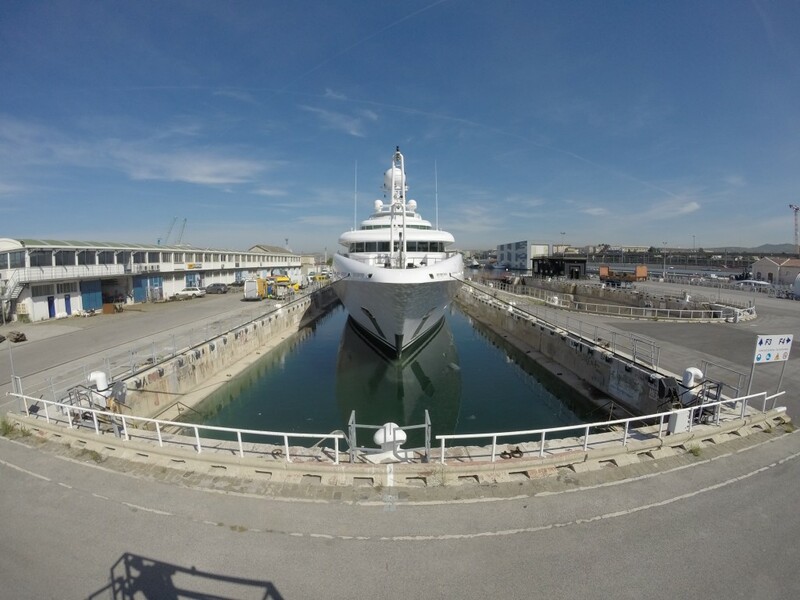 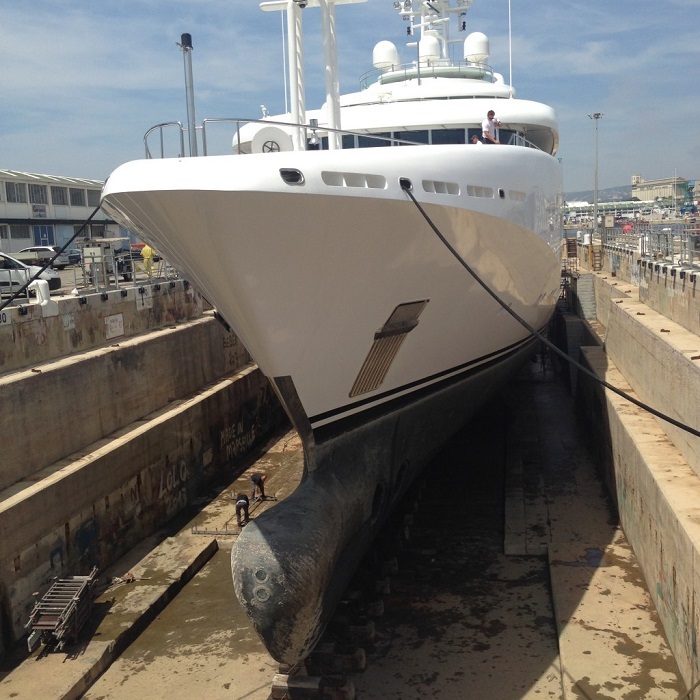 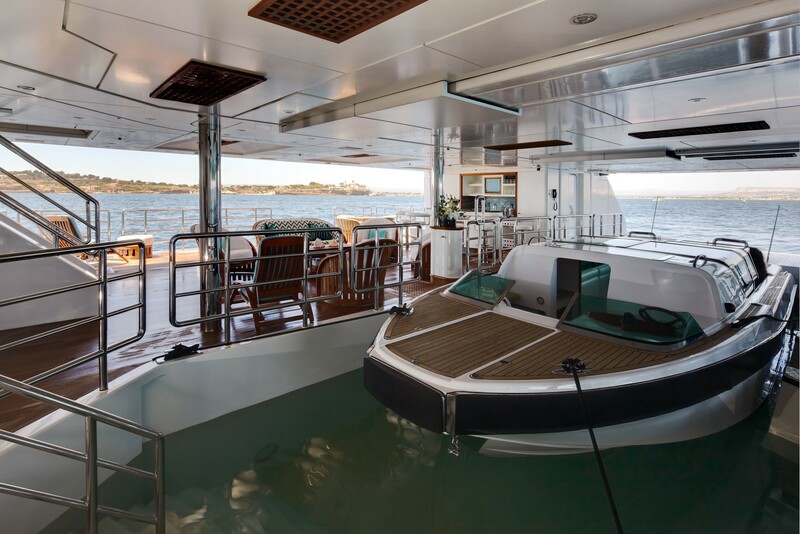 This is a dry dock for the custom built tender which disembarks guests directly inside the yacht which can be “flooded” when the tender is outside and forms a 12 metre swimming pool with underwater lighting and steps. 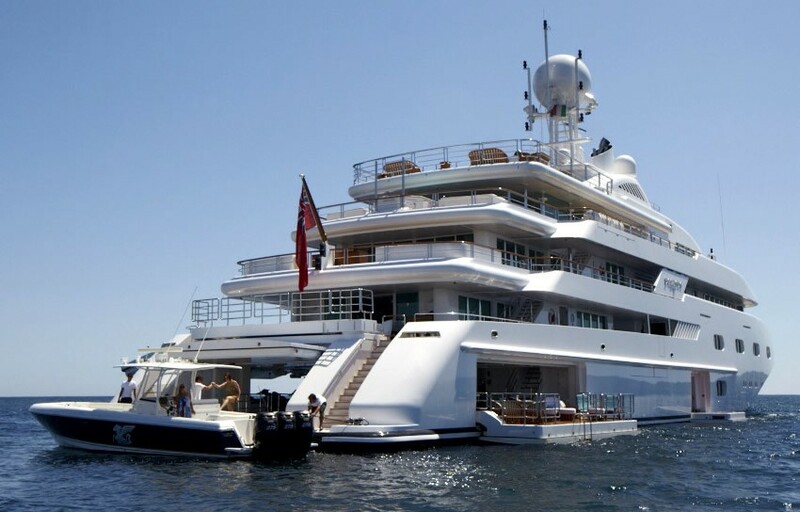 Port side in this area is home to the 6 waverunners. 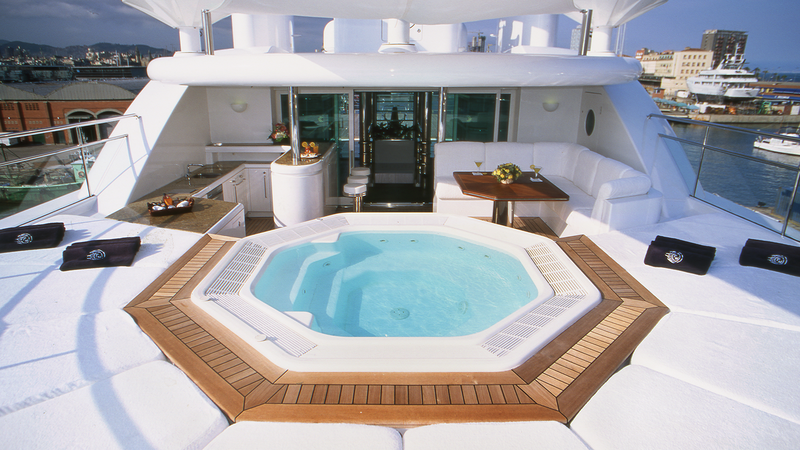 This area also features a wet bar and bathroom with steam shower. 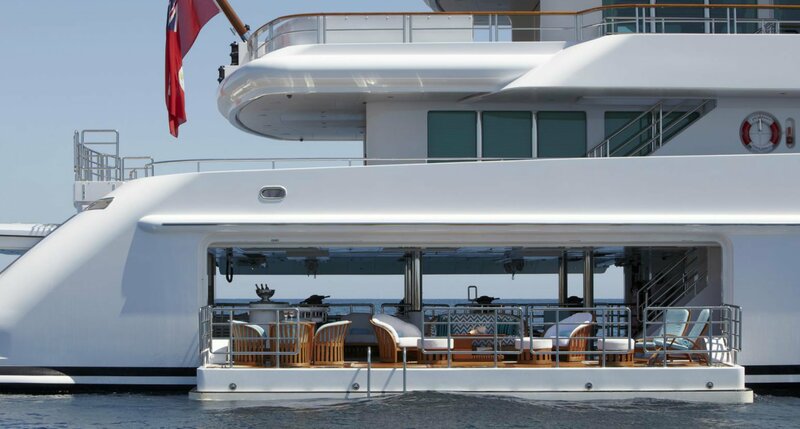 In addition to this, a large length of the starboard hull wall lowers to just above sea level, creating a large beach club. 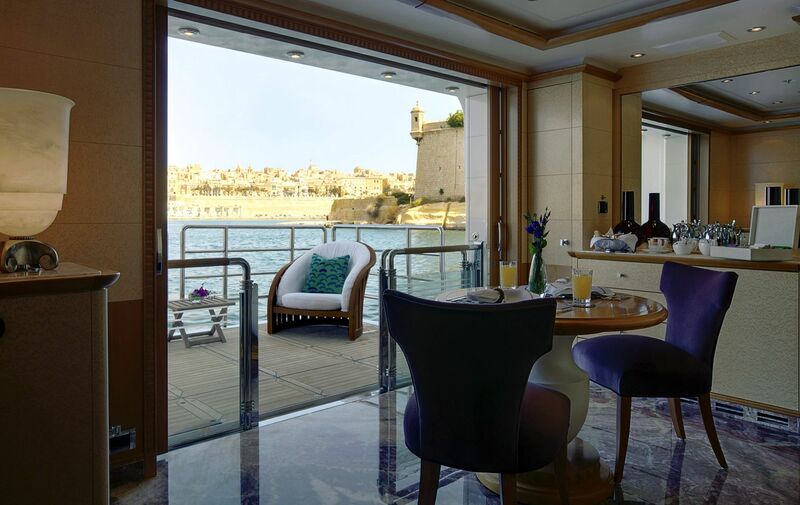 "The Beach Club" is an incredible space for guests to enjoy that is a large sea terrace with tables, chairs and lounges. 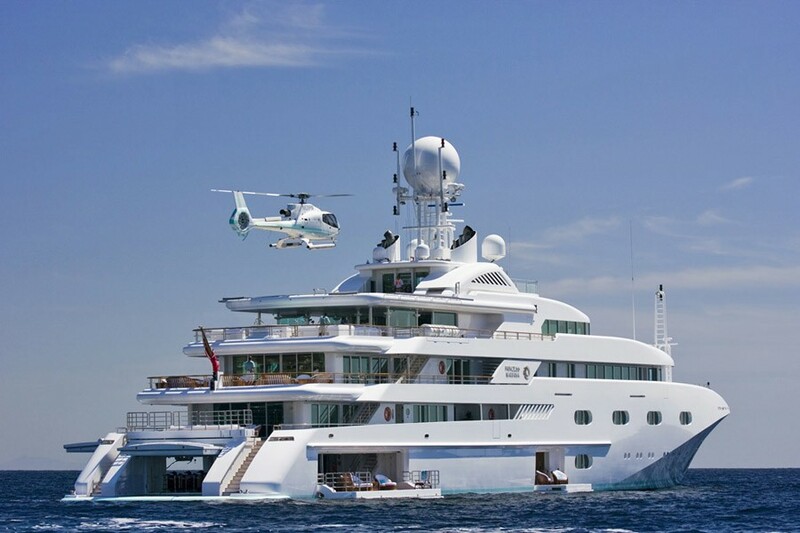 There is also a helipad on board – and when the helicopter has left, it becomes a golf driving range with a massive screen showing a host of well-known courses. 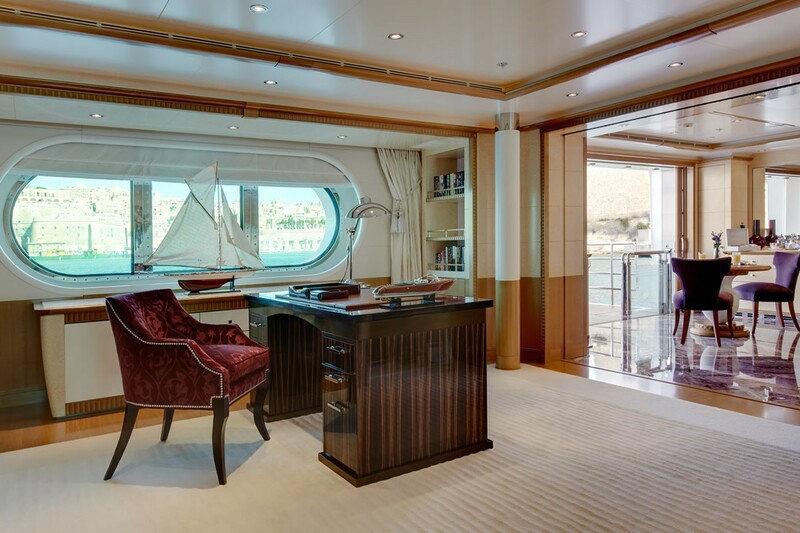 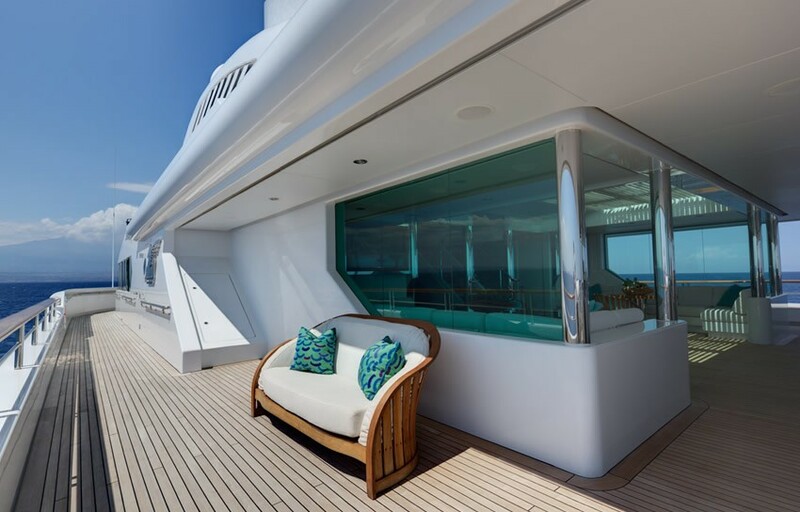 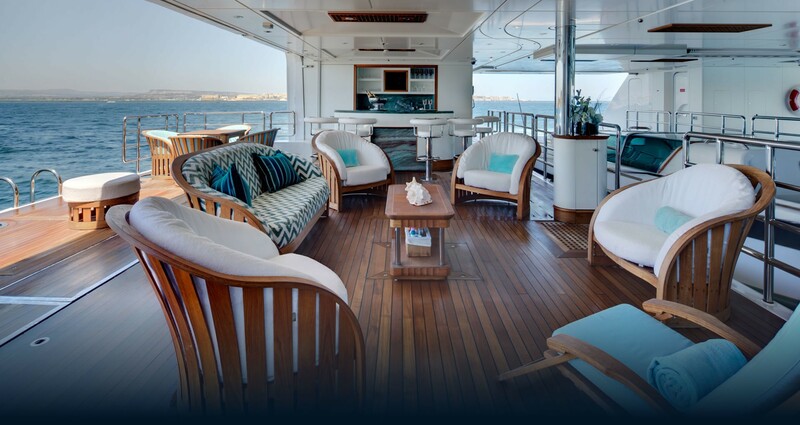 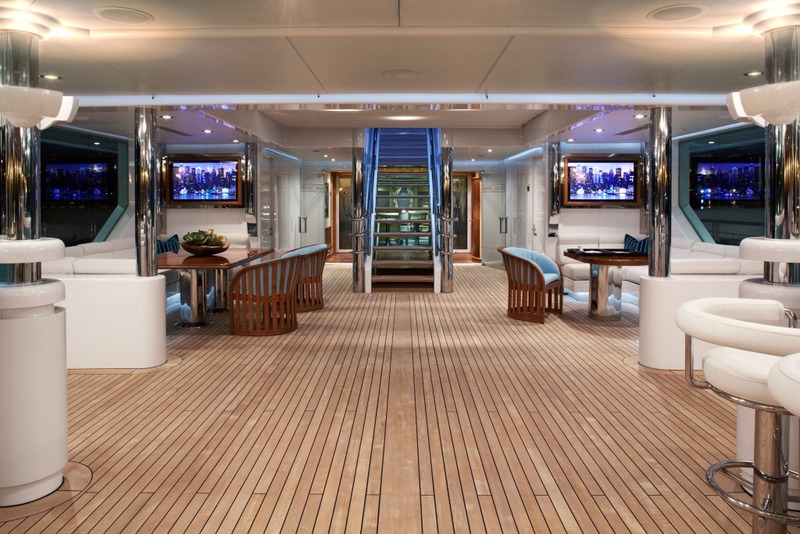 On the main deck of mega yacht PEGASUS VIII is a large elegant salon with a wet bar. 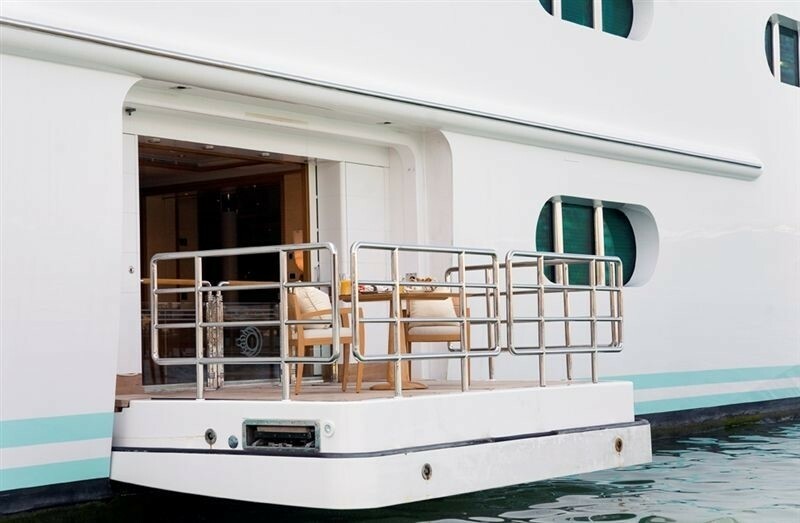 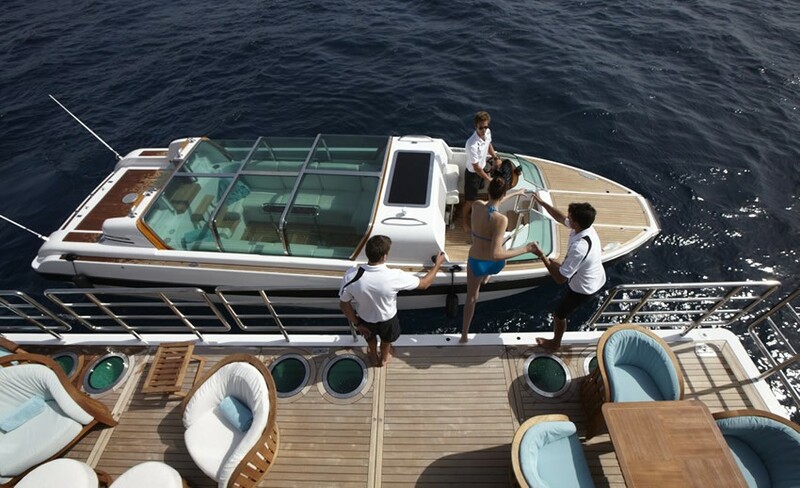 The spacious aft deck has alfresco dining for 12. 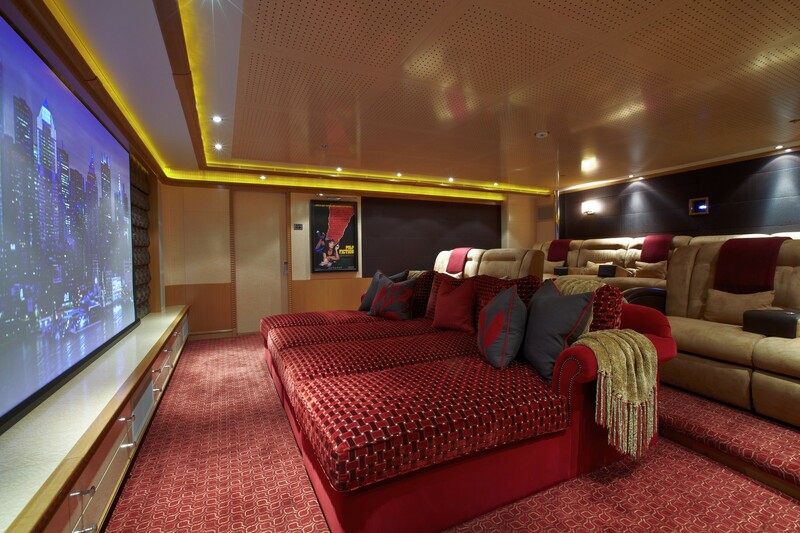 There also a very comfortable cinema with 13 large reclining chairs. 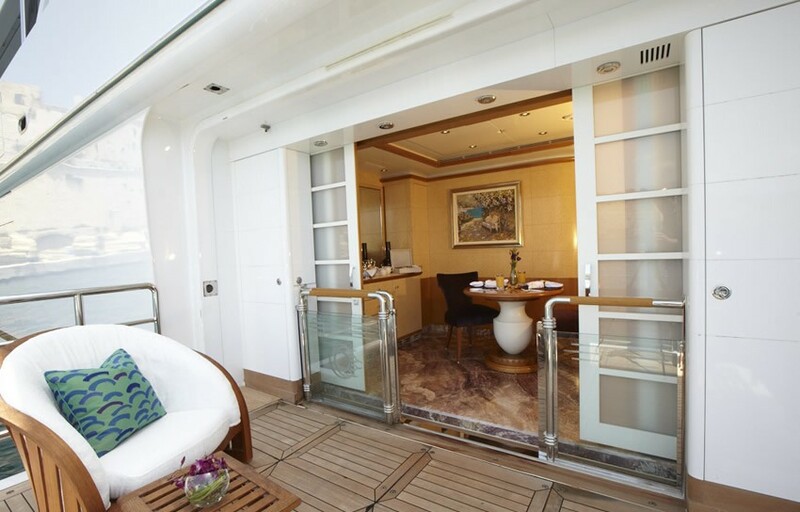 All guest staterooms are also located on the main deck. 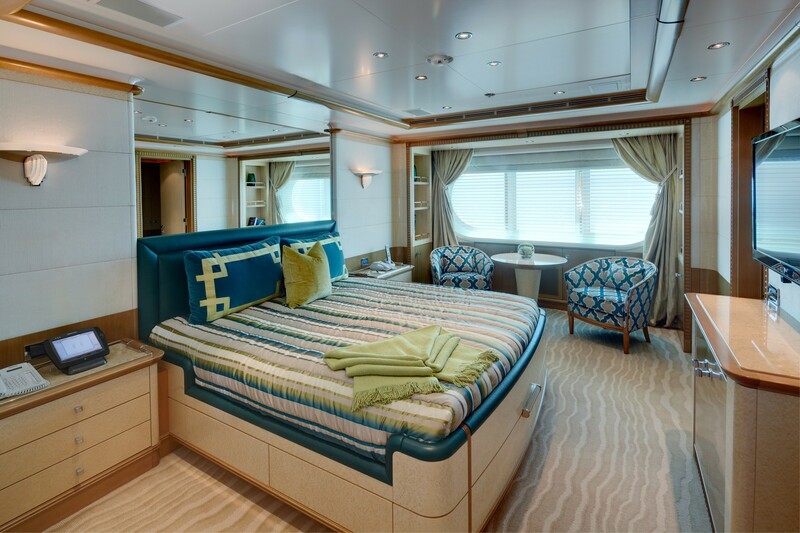 There are 5 guest staterooms (4 double and one twin cabin) which all have plasma TV’s and private ensuites. 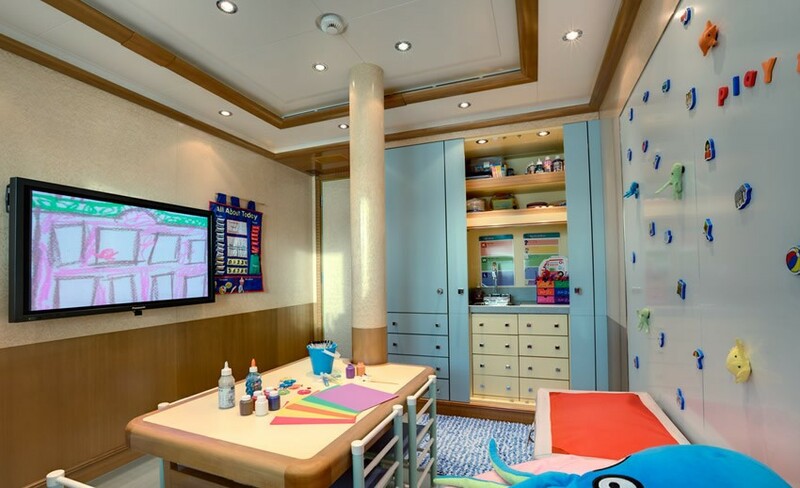 The entertainment system on board has a huge capacity for storage with plenty of music and DVD’s to choose from. 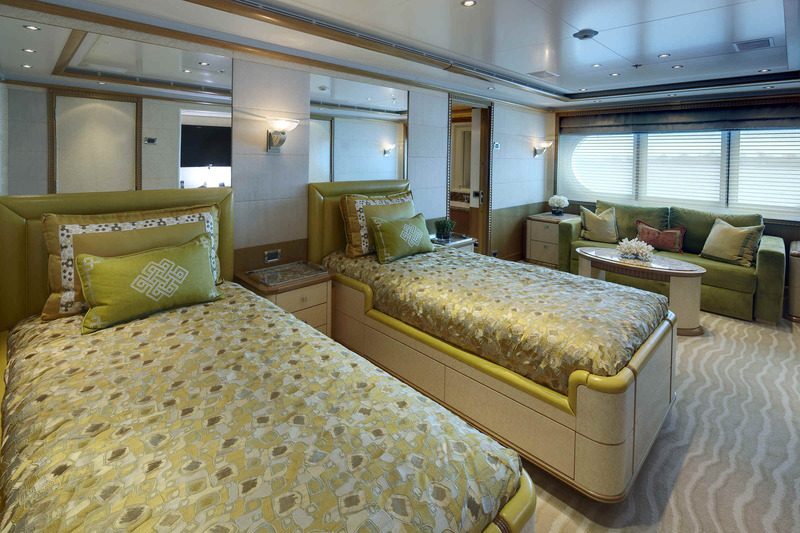 This system can be accessed from all staterooms. A main feature of the lower deck is the 'sea terrace.' 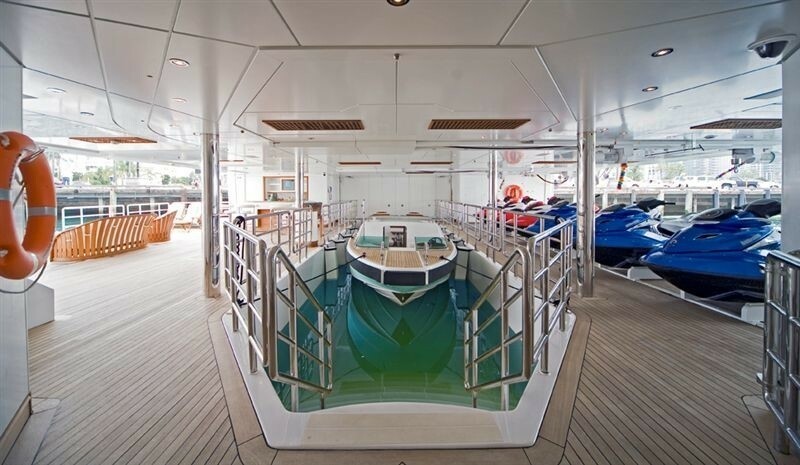 A part of the starboard hull wall lowers to create a large terrace which lies over and with direct access to the sea. 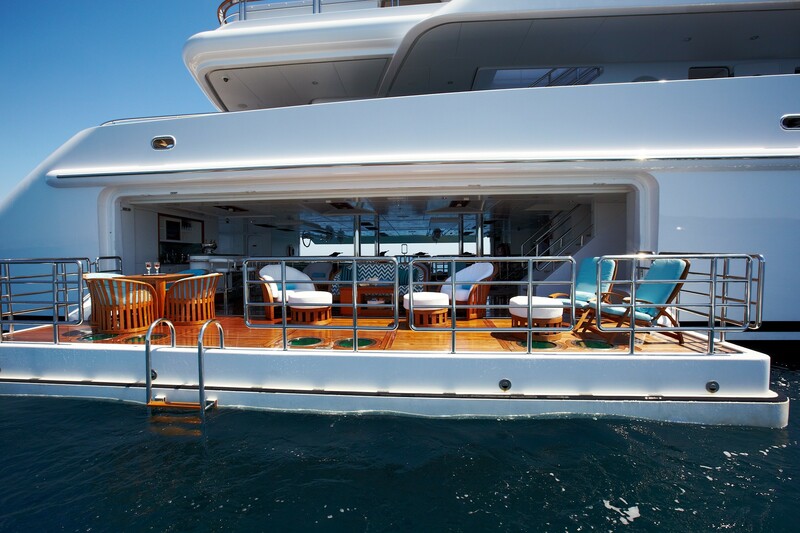 There are sun loungers, teak deck chairs and tables. 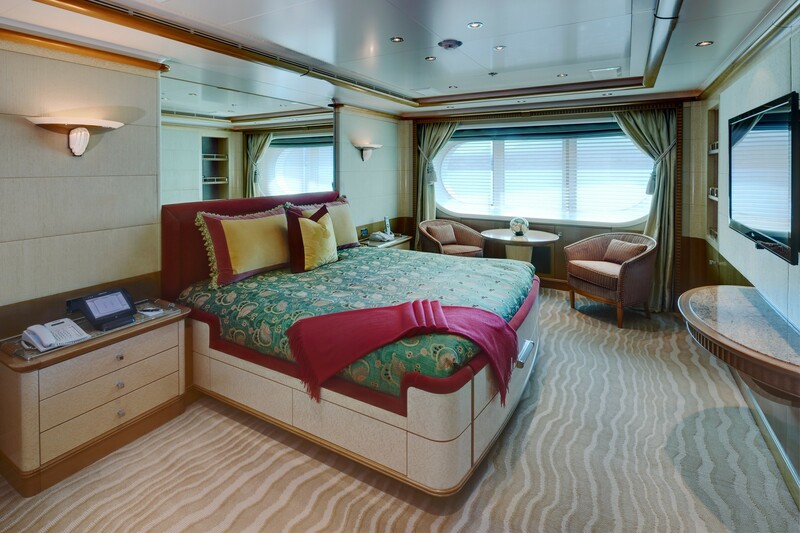 The Master stateroom also has private access to main deck gym and the twin stateroom. 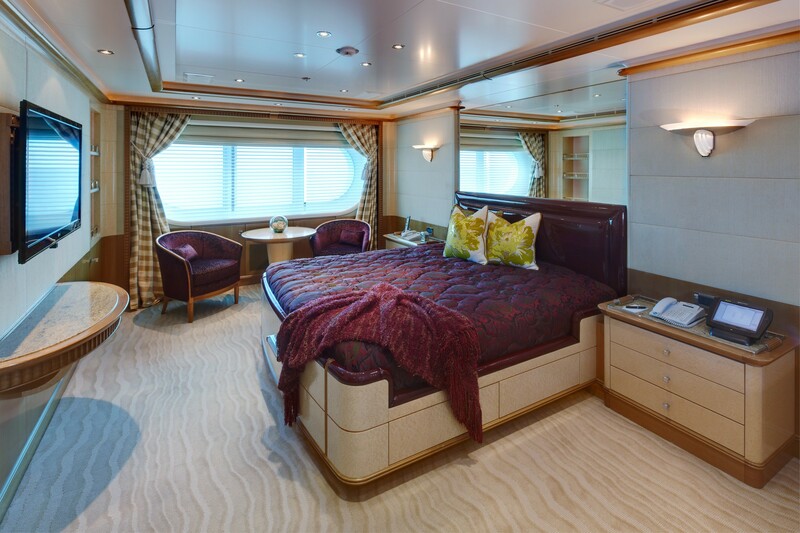 Aft of the master stateroom is a sound proof glass corridor over the engine room so guests can walk aft and view the engines in comfort. 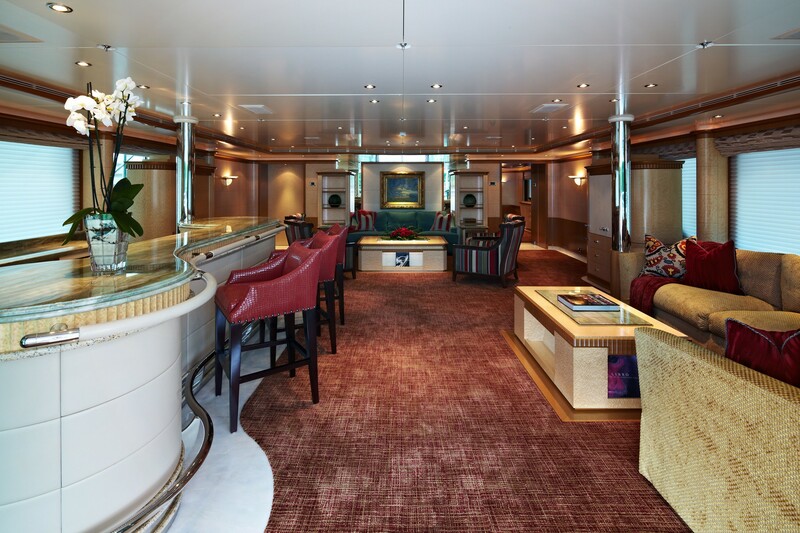 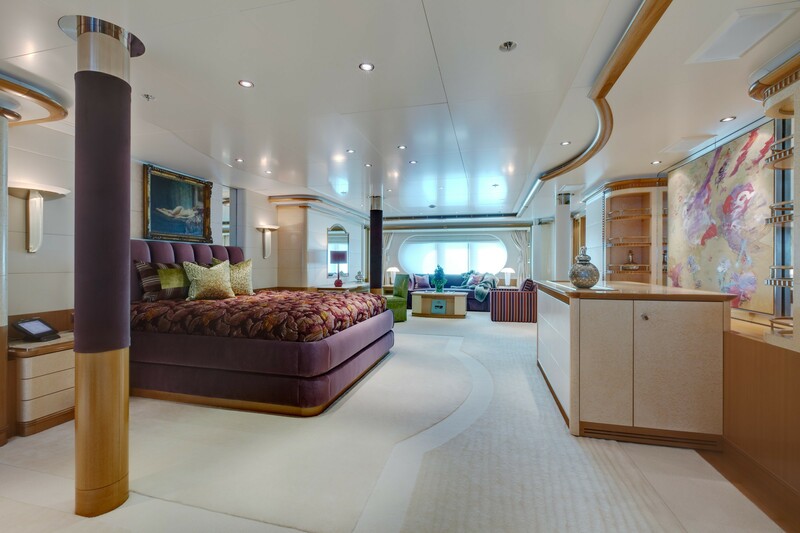 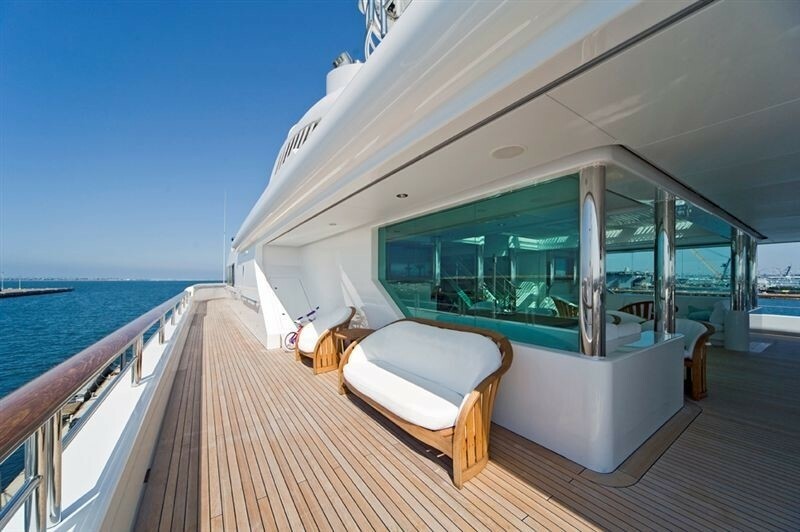 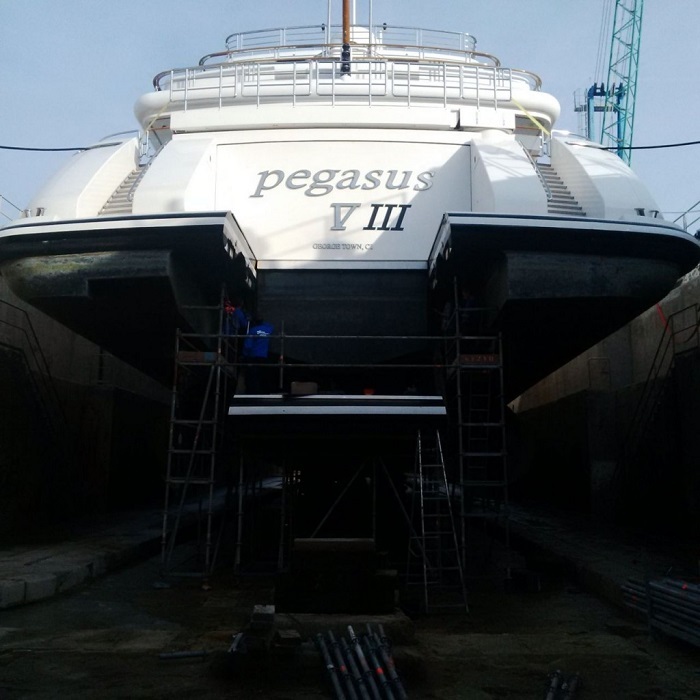 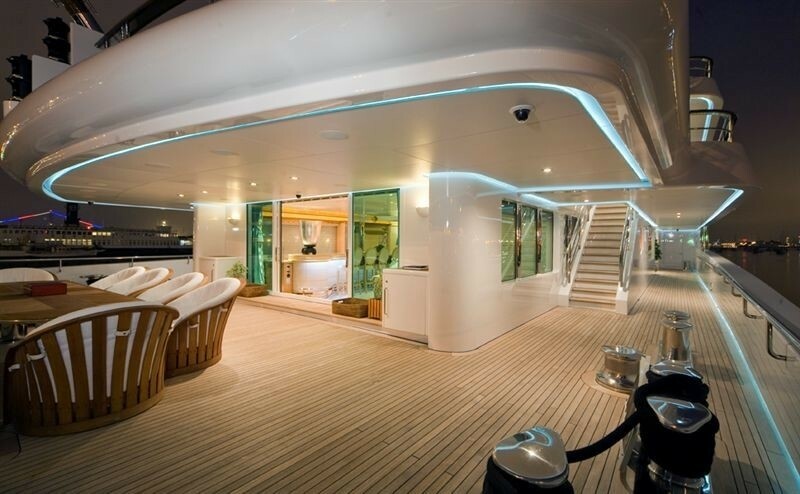 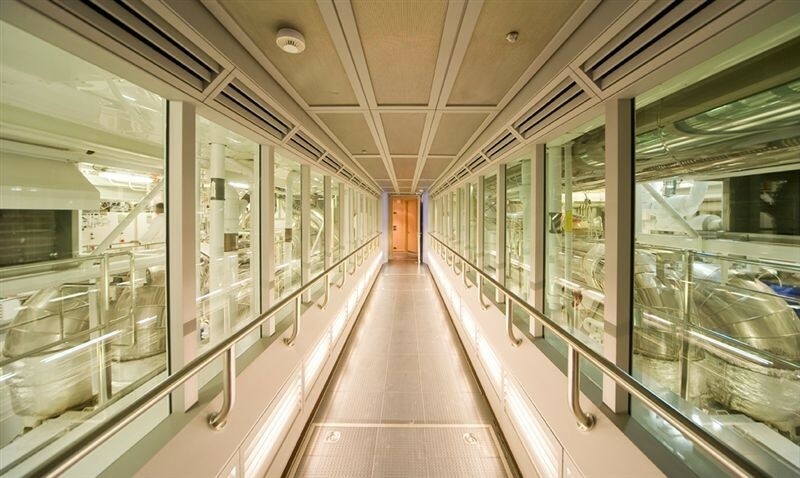 The Bridge Deck of PEGASUS VIII offers an ‘upper salon’ with a bar and games table. 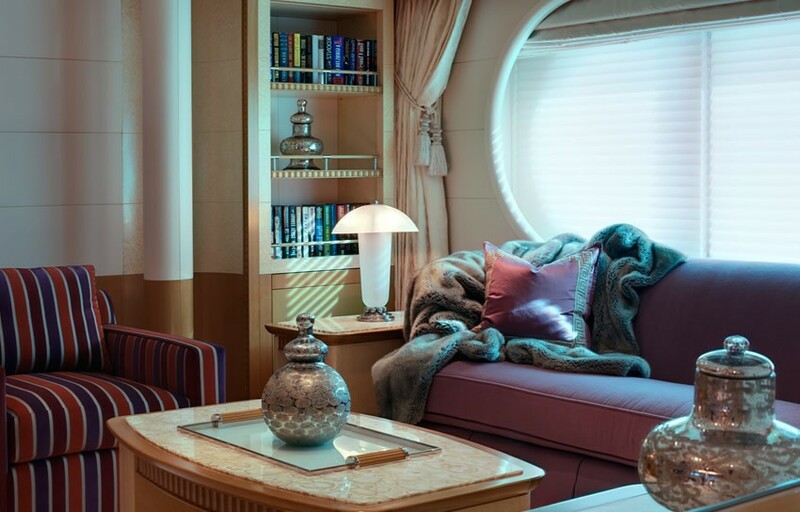 There is also a formal dining area for 12 guests along with a Beauty parlour/massage room and a children’s play room with table & chairs, paints, toys, large screen TV/DVD etc. 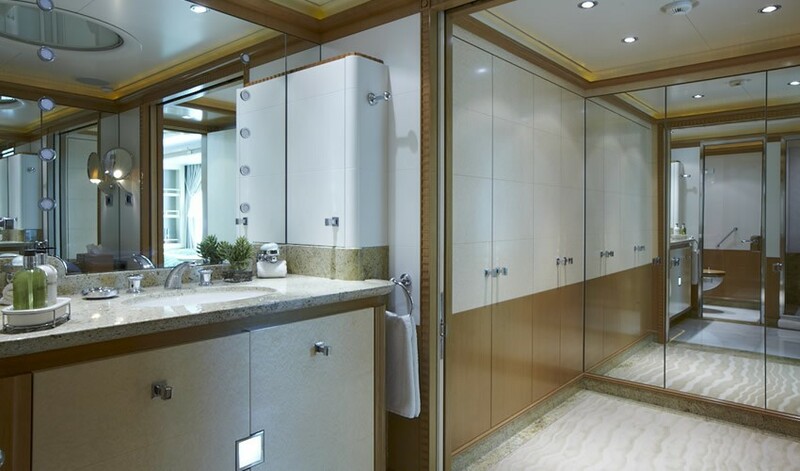 On this level there are two European style powder rooms. 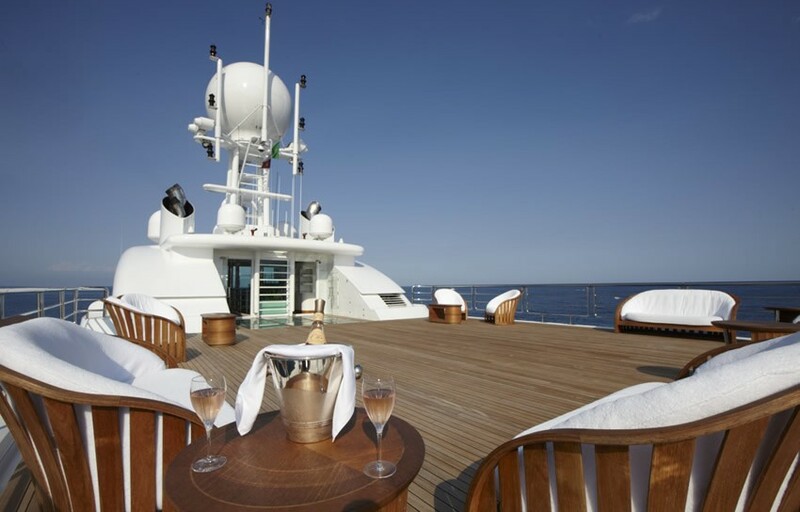 Outside, there is casual seating on the aft deck. 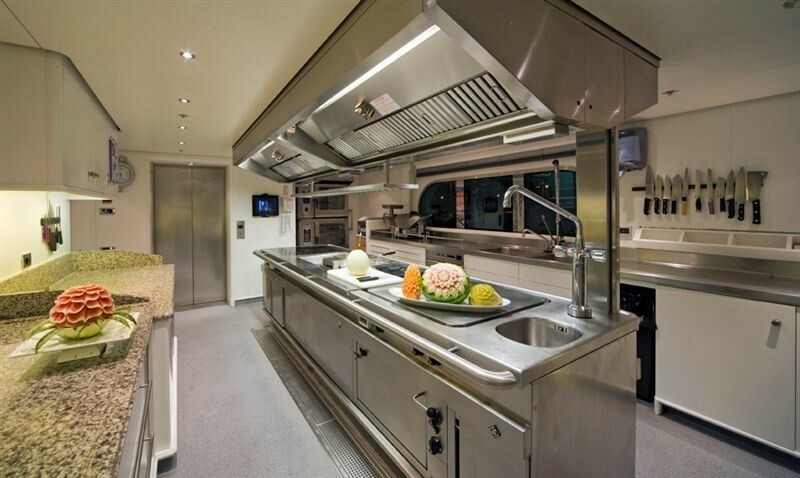 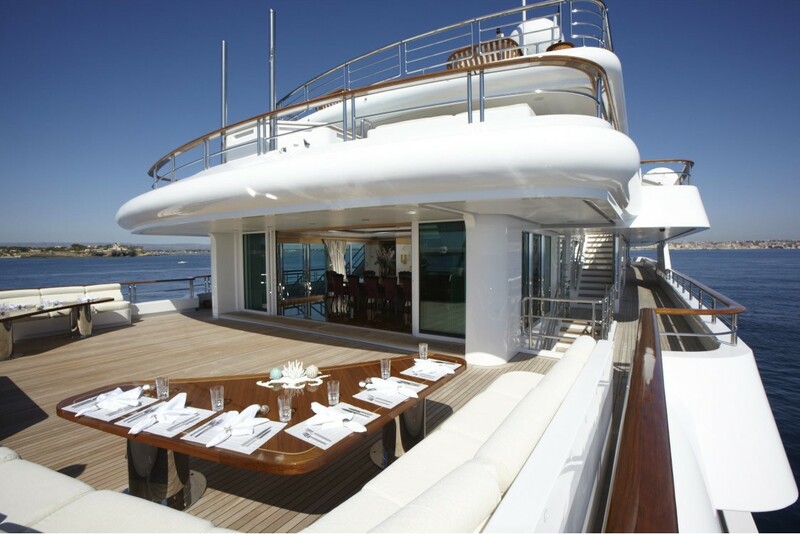 The decks on board Pegasus VIII are extremely spacious and there are plenty of dining opportunities to choose from. 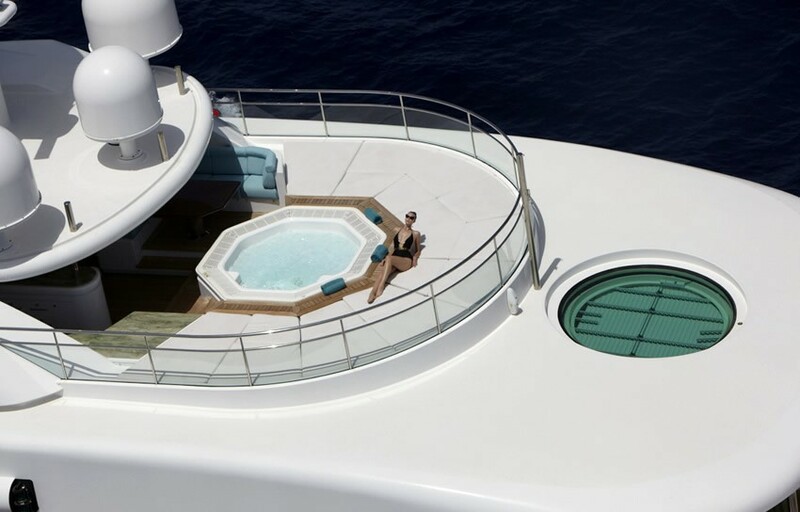 One level up from the bridge deck is the party deck with two bars, casual seating areas, a raised dance floor, a grand piano, three cinema screens, a barbecue, sun beds and a Spa Pool! 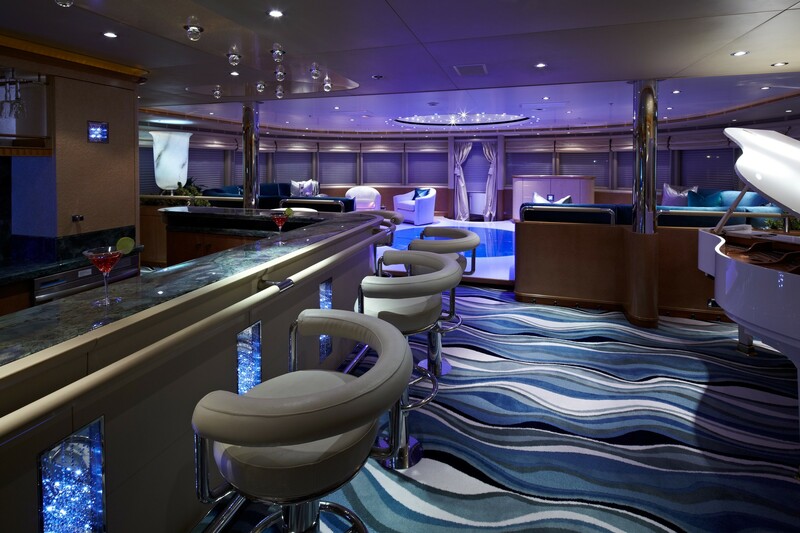 Forward is the Disco with lighted dance floor, Grand Piano and oversized bar. 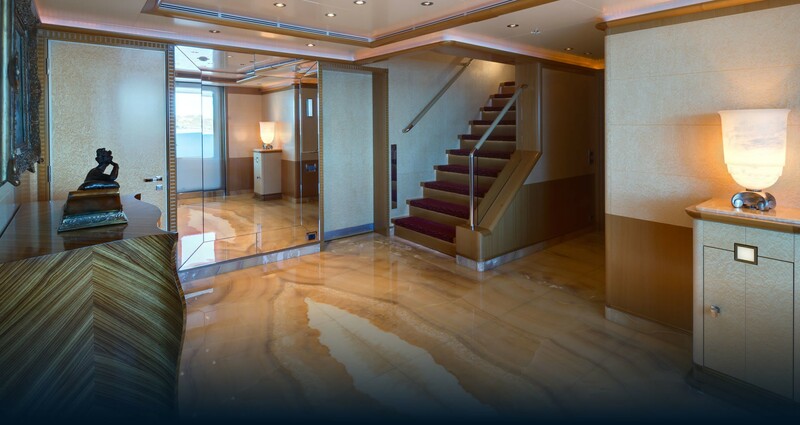 There are also two powder rooms on this level. 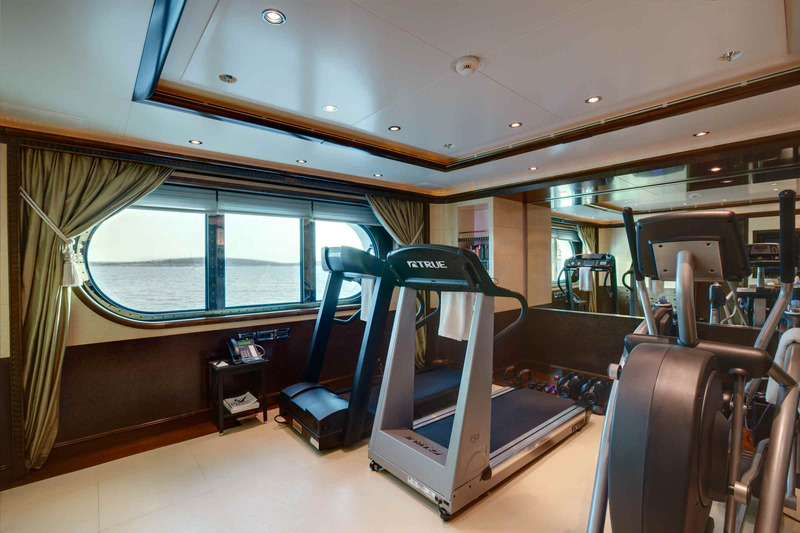 There is also a fully equipped gym on board with an elliptical machine, treadmill, exercise bicycle, and free weights. 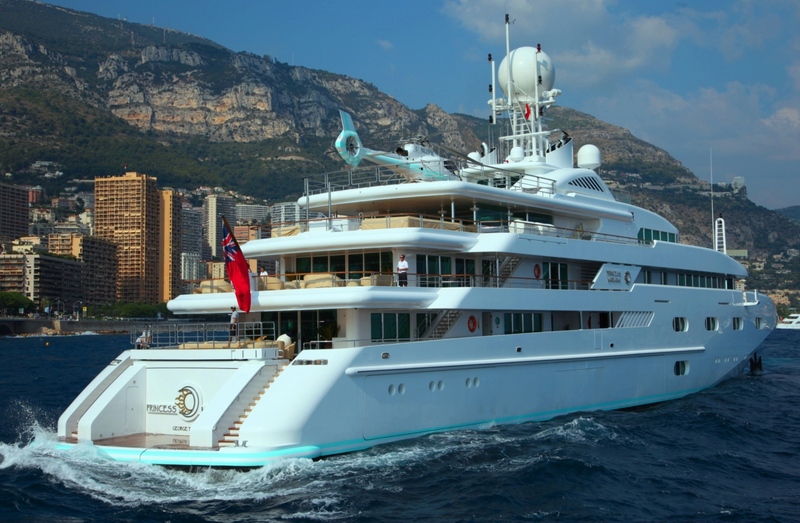 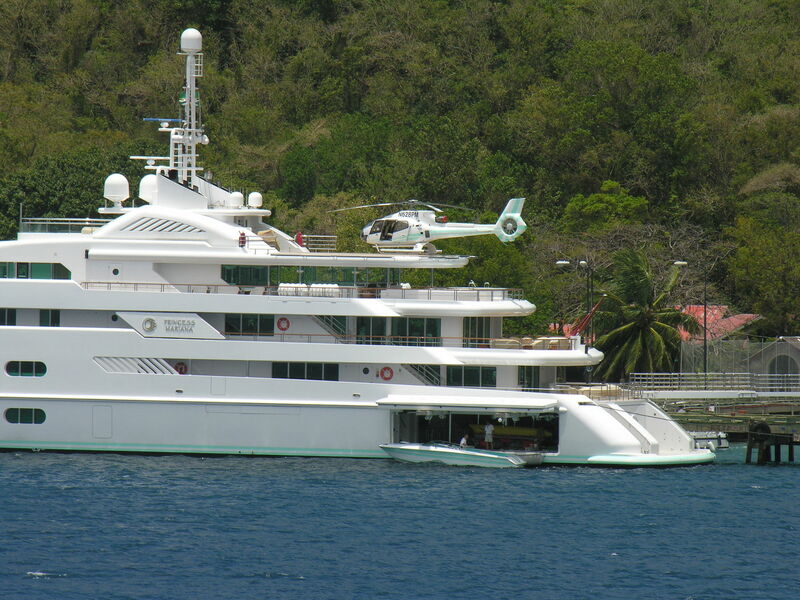 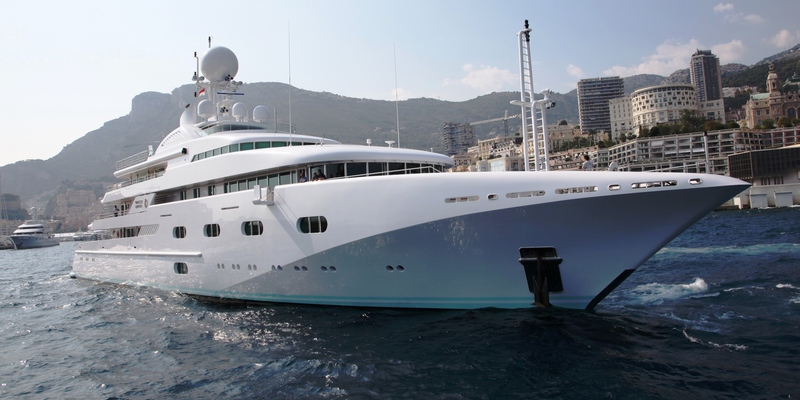 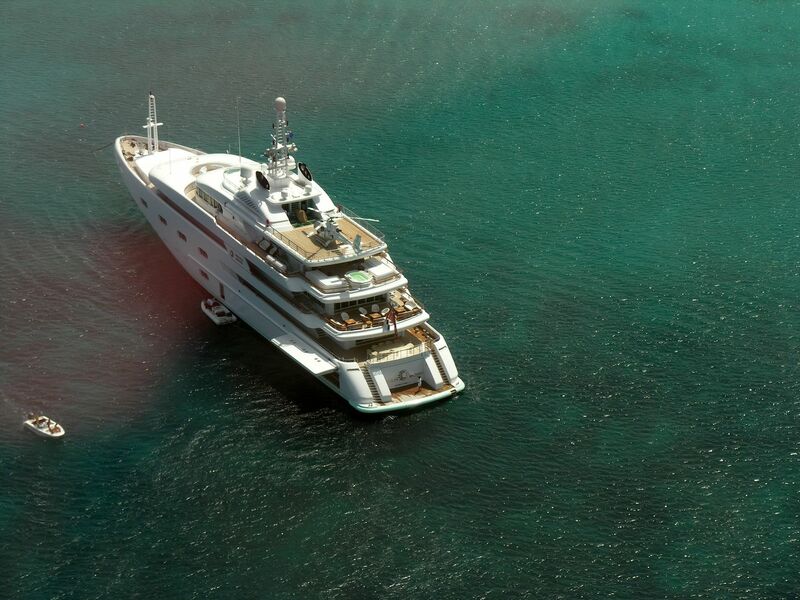 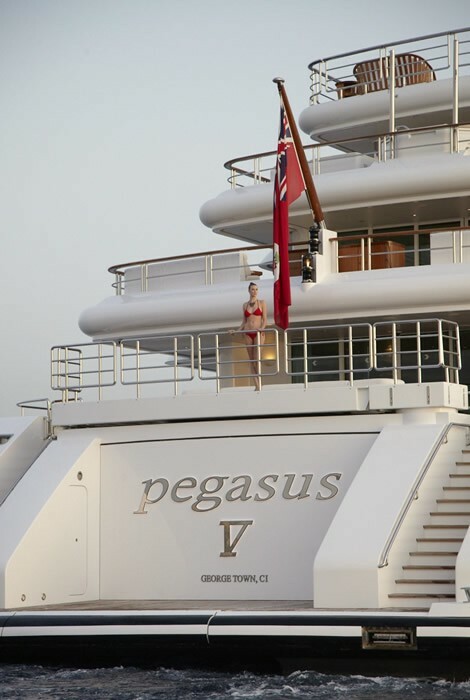 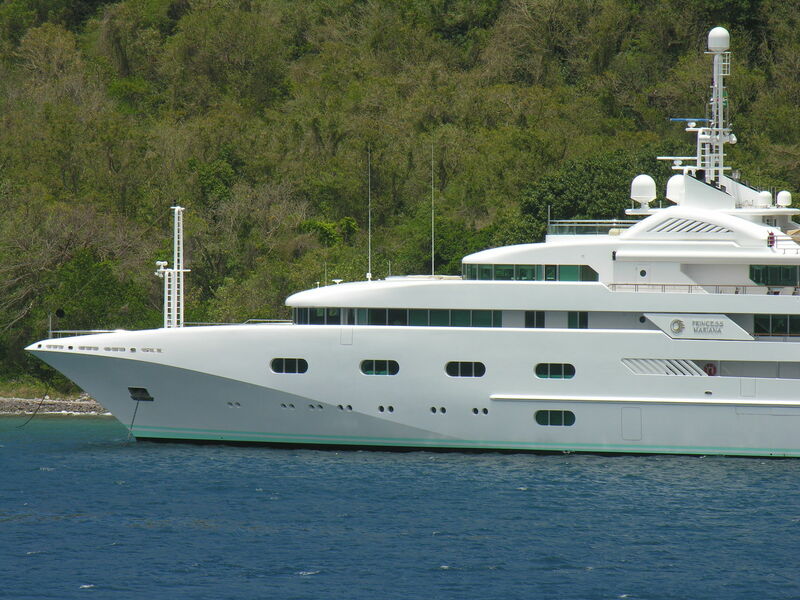 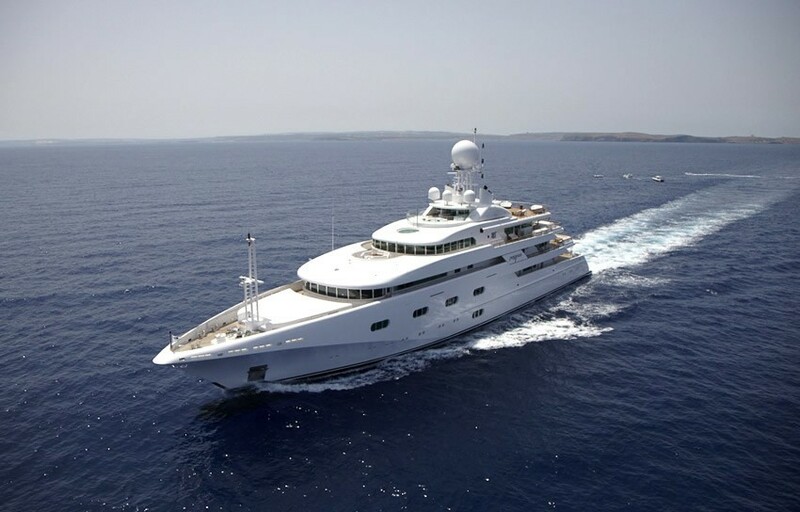 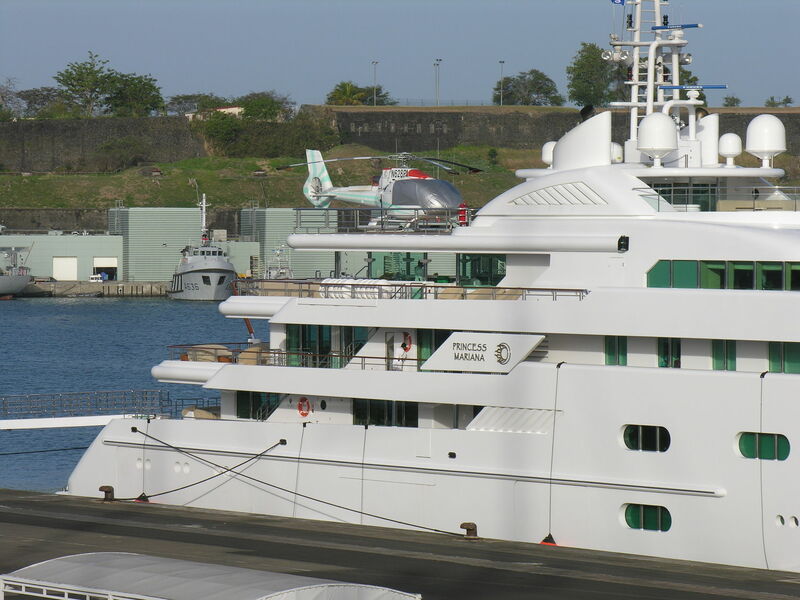 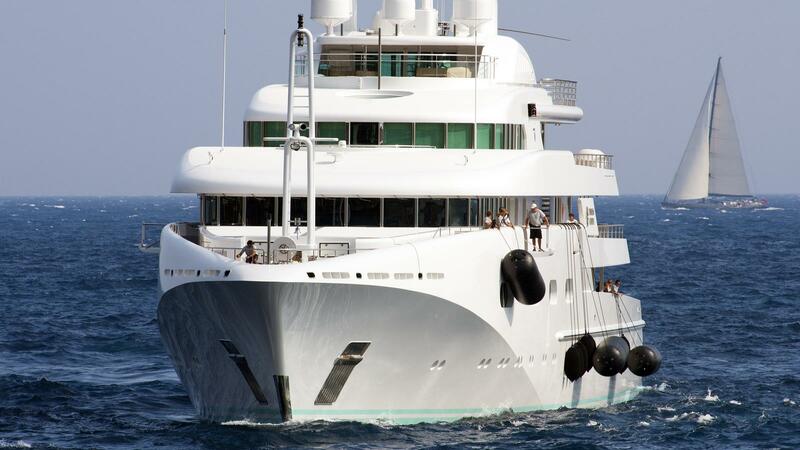 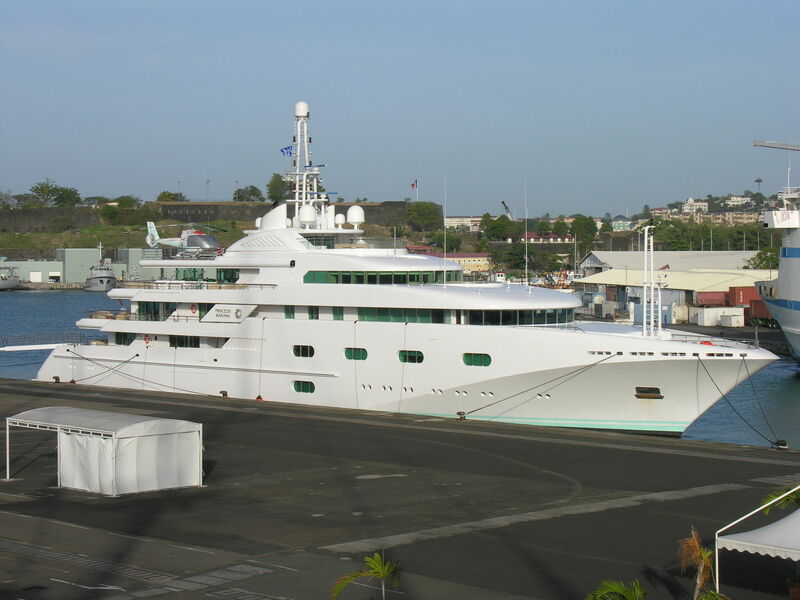 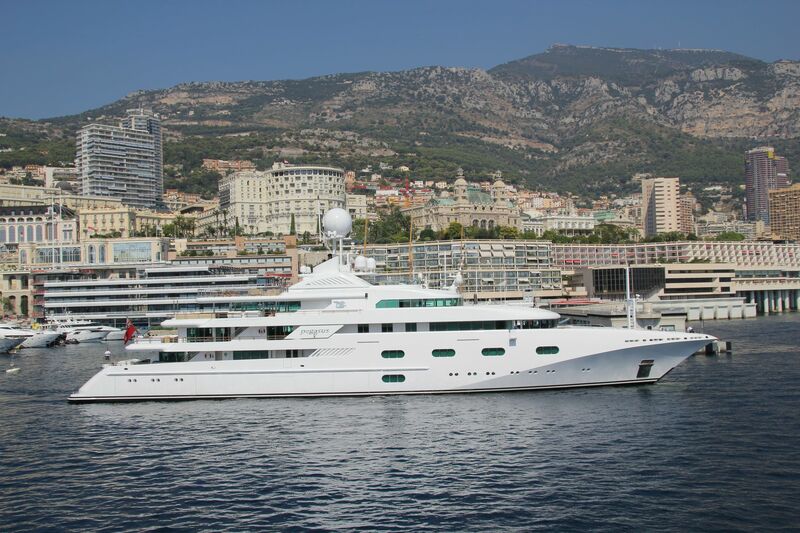 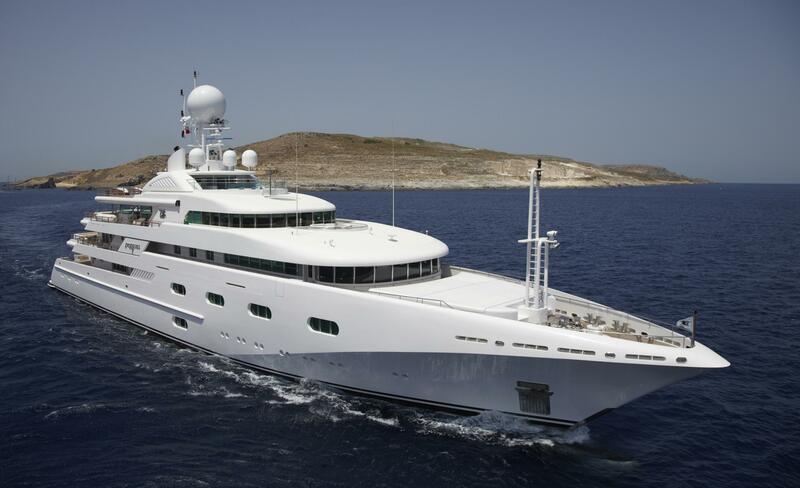 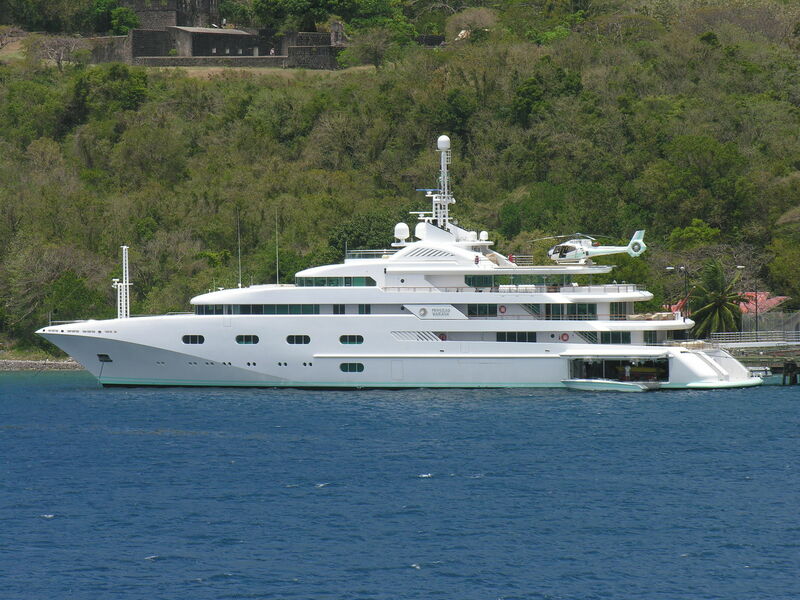 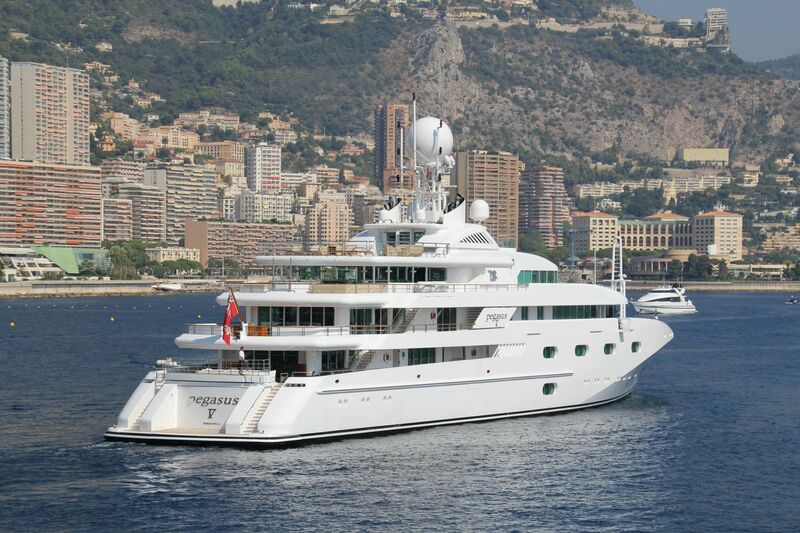 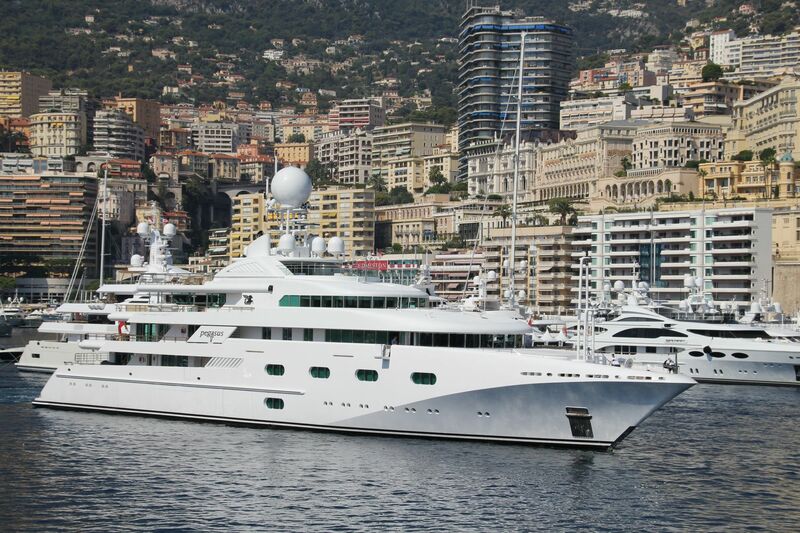 PEGASUS VIII has 6 luxury staterooms. 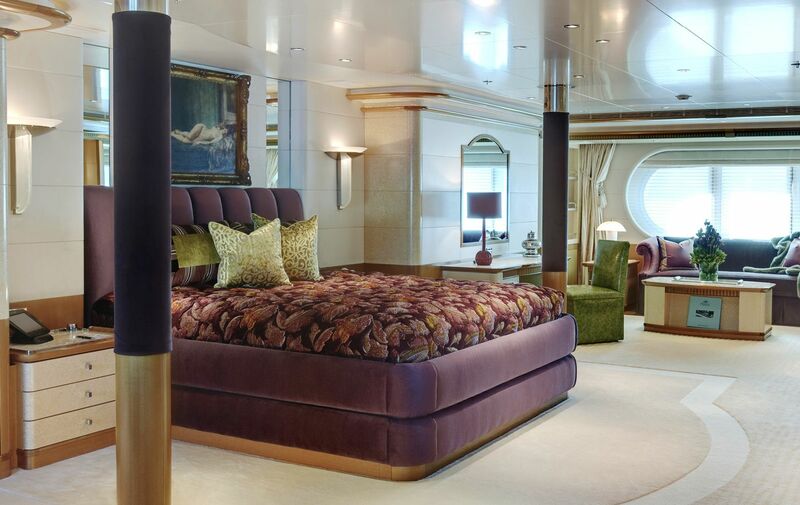 The owner's state room is below deck and has a king size bed with two showers, two steam rooms and a spa tub. 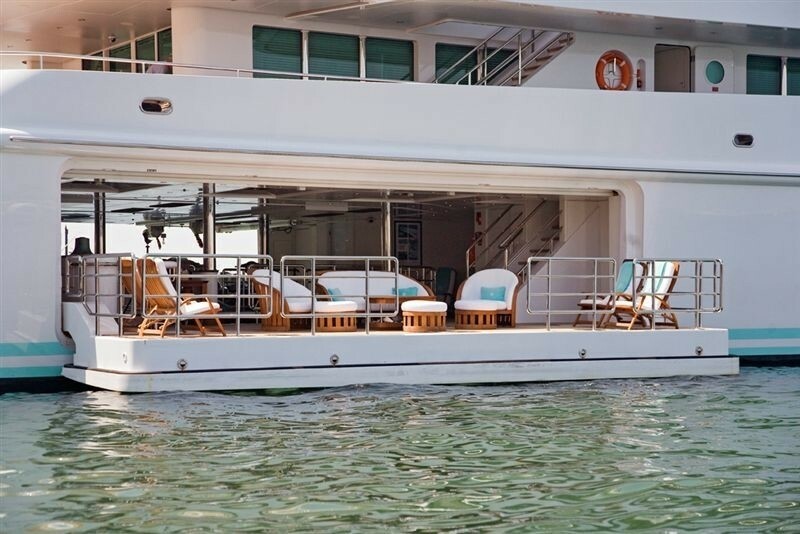 In addition to this there are four double guest suites with showers, and a twin guest suite with a bath. 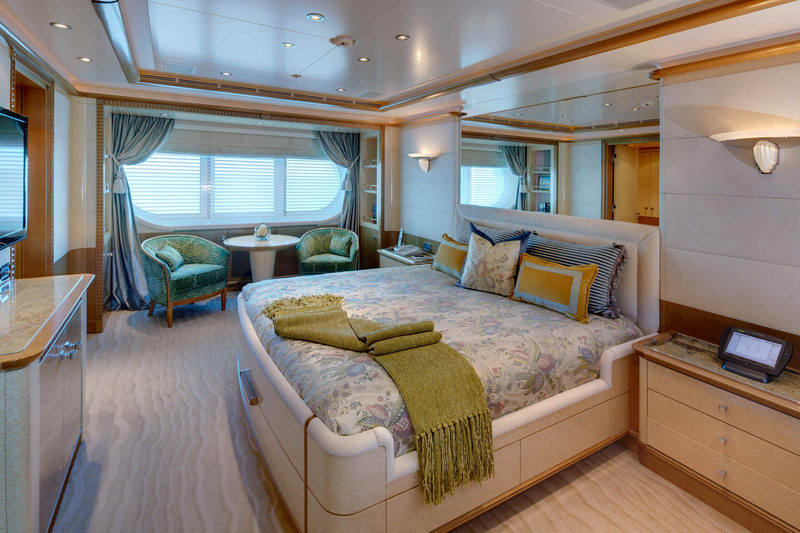 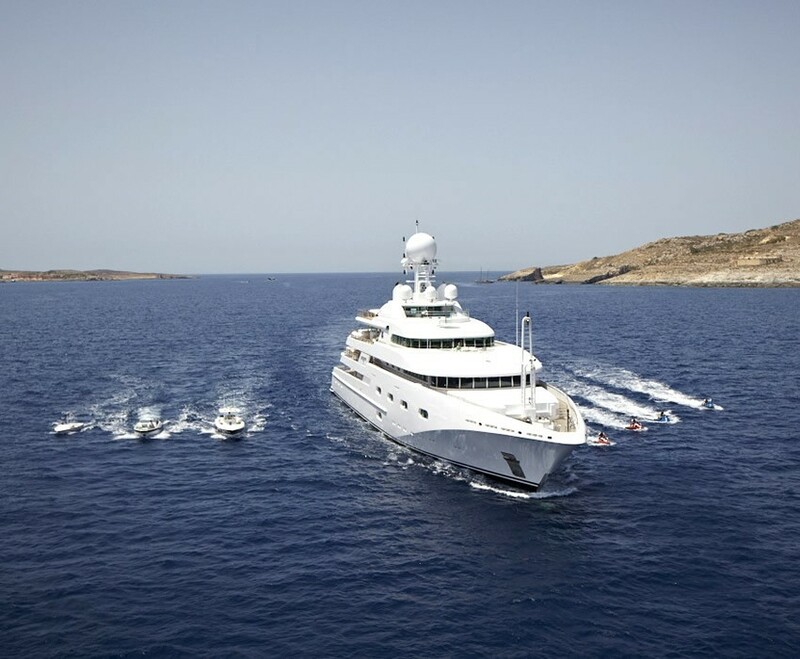 M/Y PEGASUS VIII’s master stateroom is located on the lower deck midships. 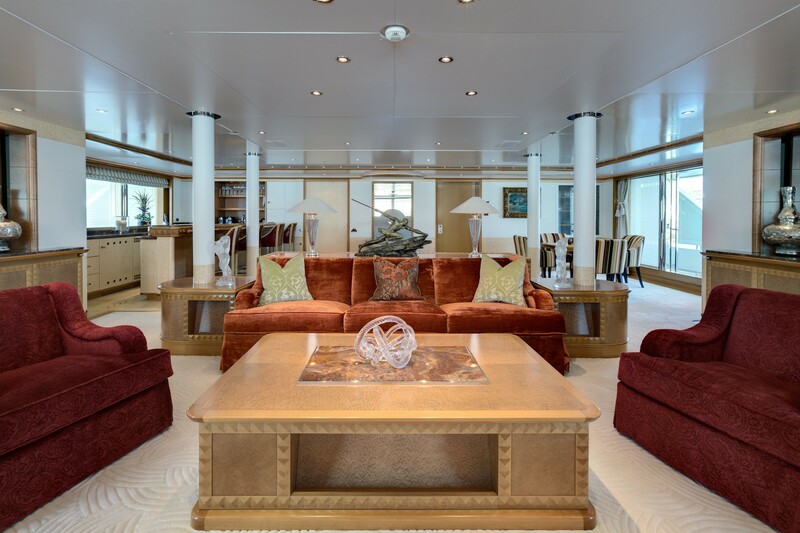 It features a king sized bed, card table with 4 chairs and sofa. 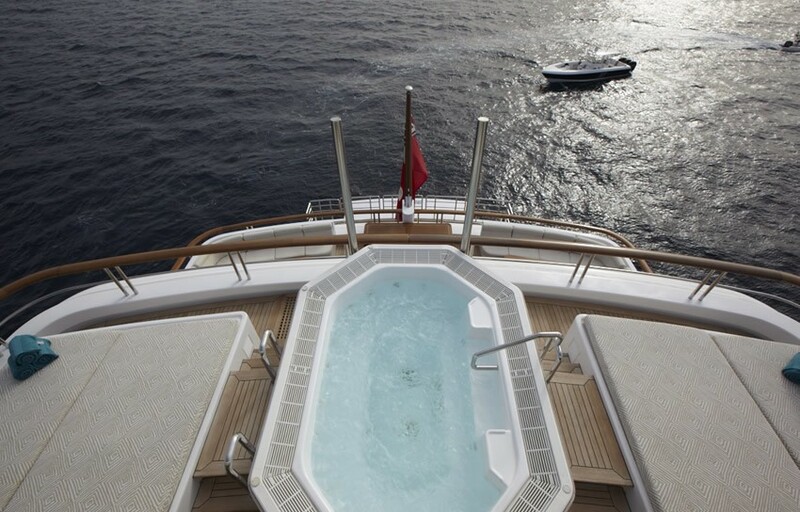 "Her" bathroom has a steam shower and large Spa Pool tub. 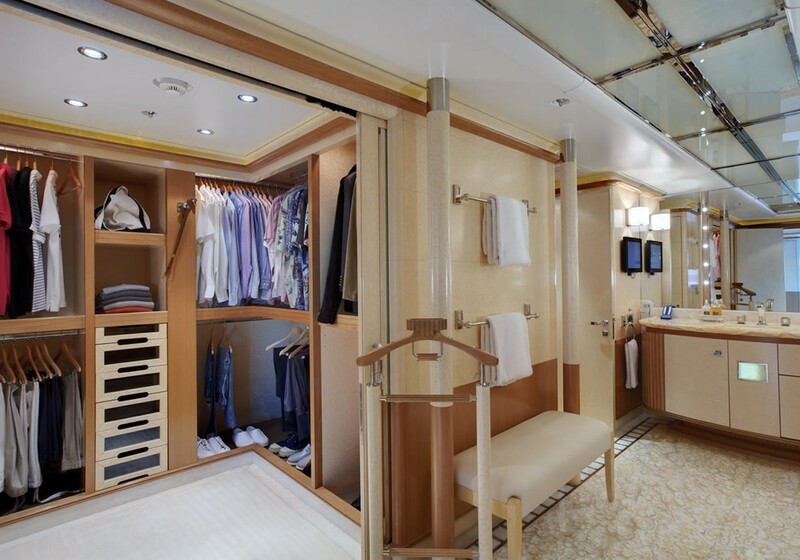 There is also a walk-in wardrobe with dressing vanity. 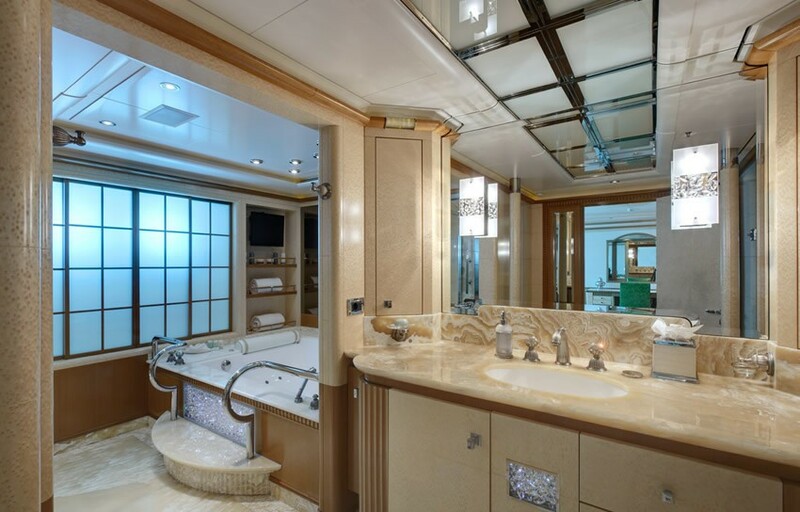 "His" ensuite bathroom features a large steam shower and walk-in closet. 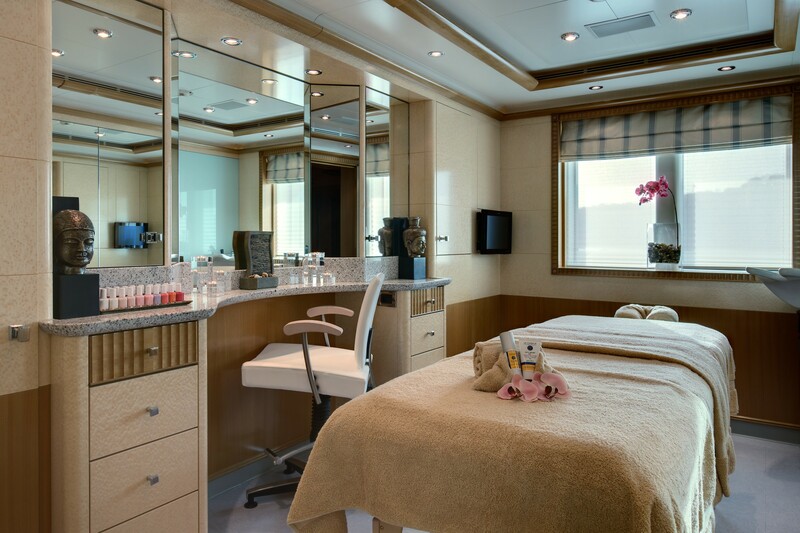 4 guests suites with showers, twin guest suite with bath. 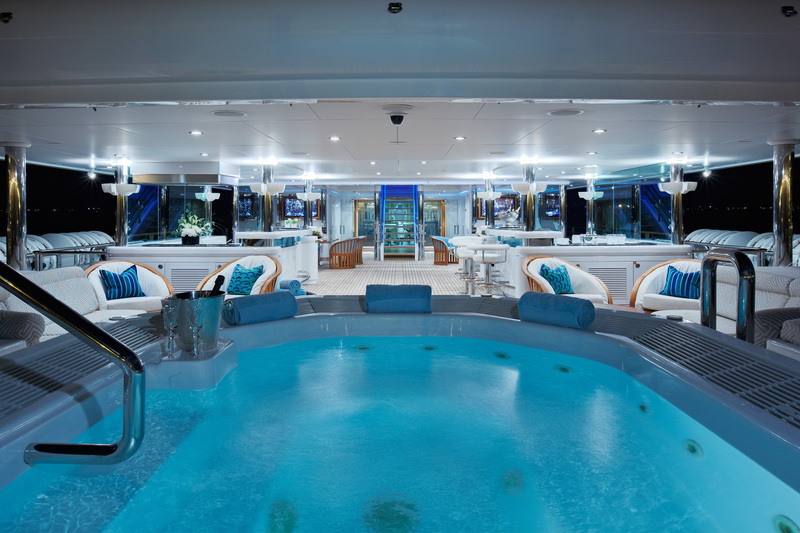 Owners suite with 2 x showers, 2 x steam rooms and spa tub. 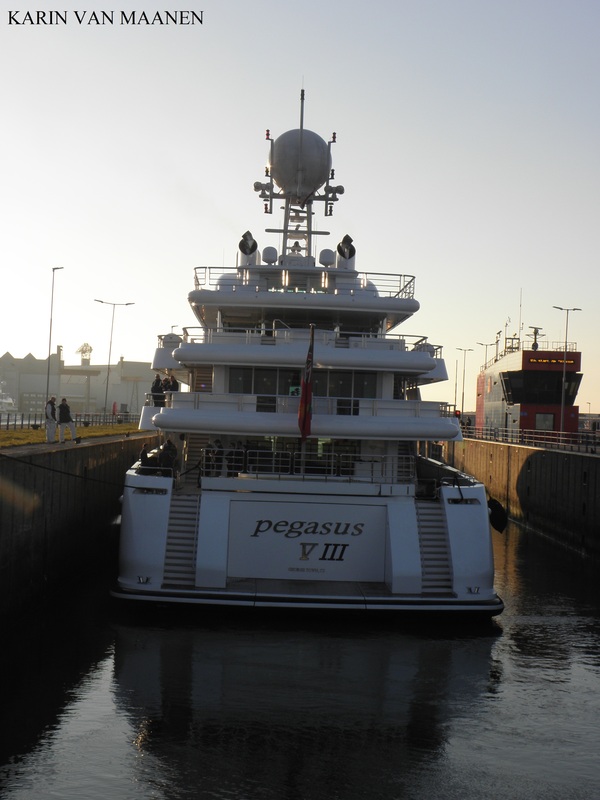 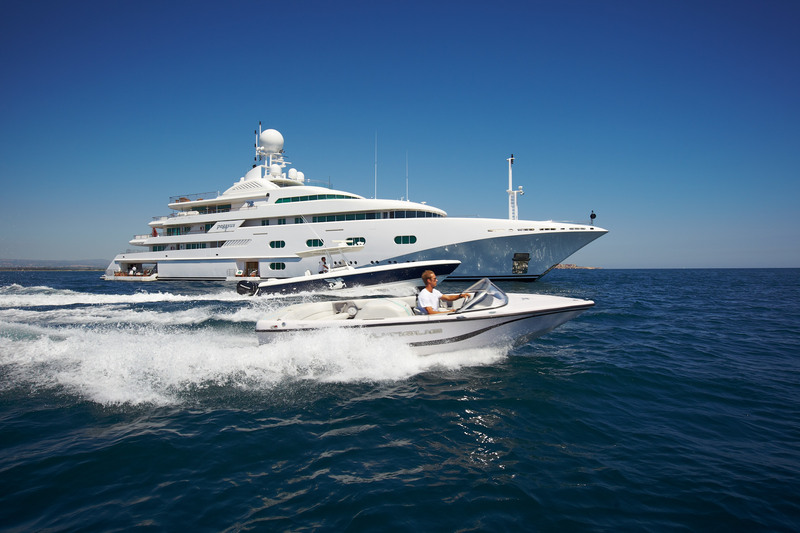 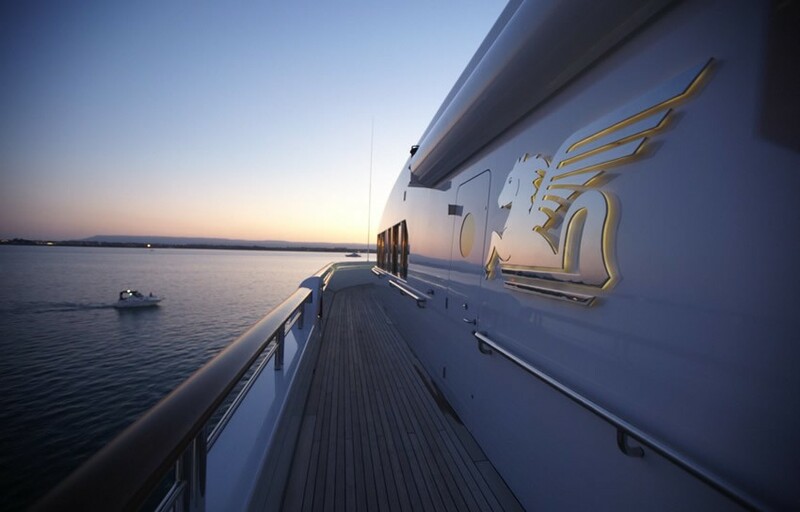 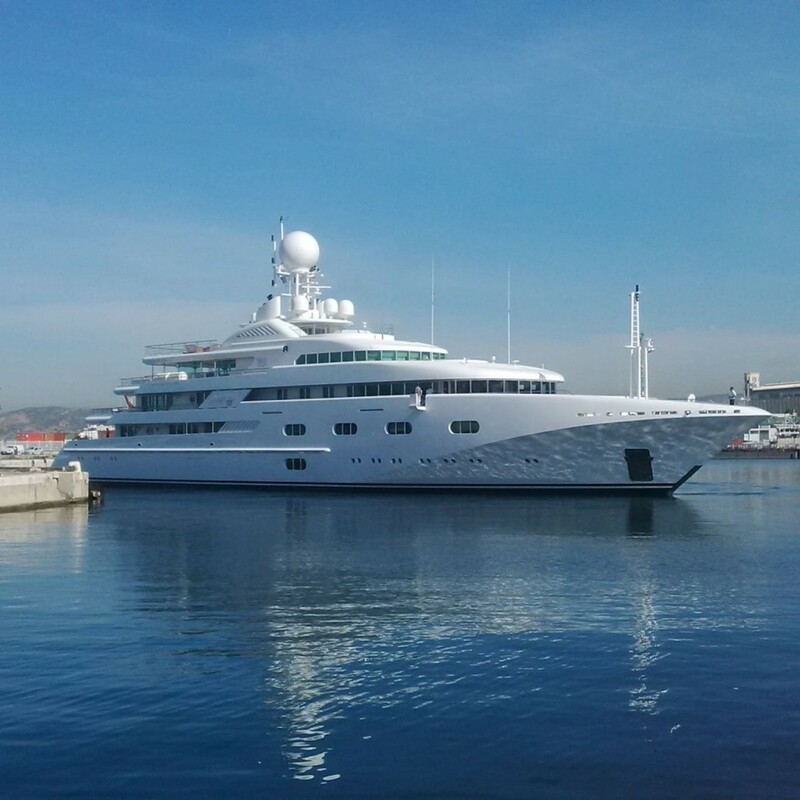 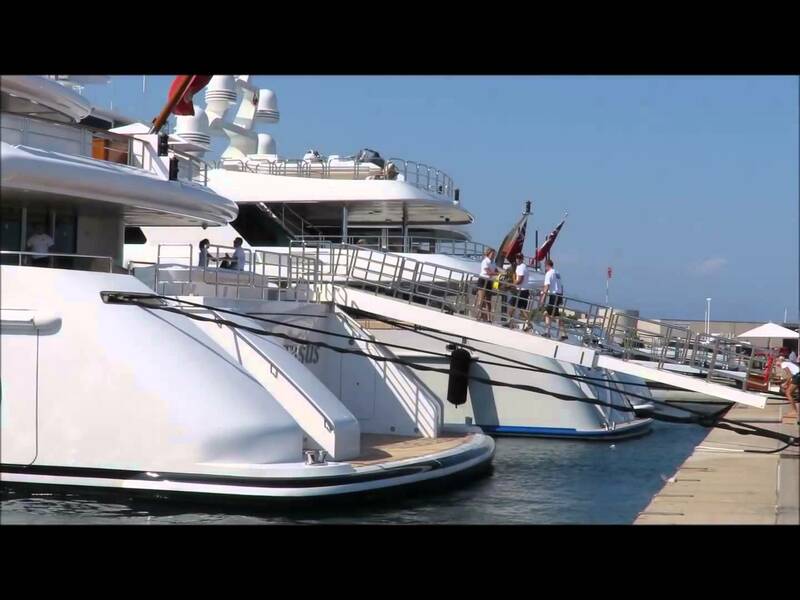 PEGASUS VIII has a full range of tenders and toys onboard plus a complete range of entertainment and communication facilities. 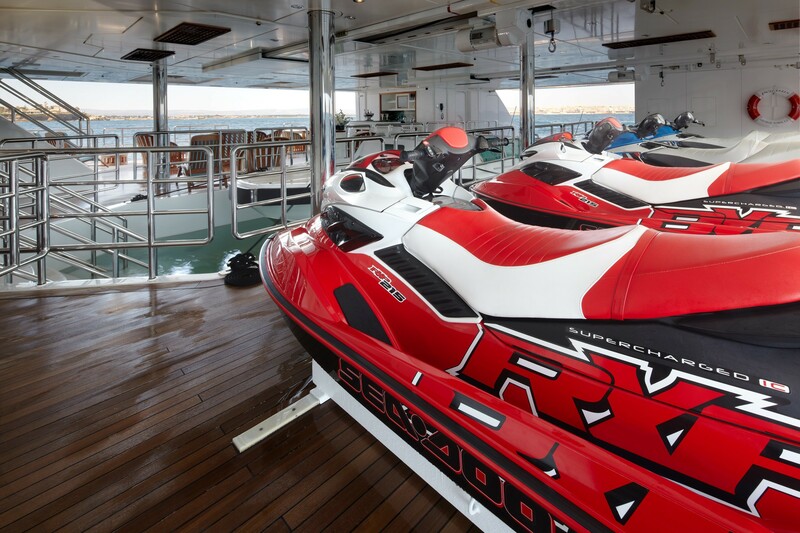 These include the following Tenders & Toys: A Custom 35´Oeino 12-seater, Ski Nautique 20, (6) Waverunners, (2) Jetskis, Assorted inflatables and towables. 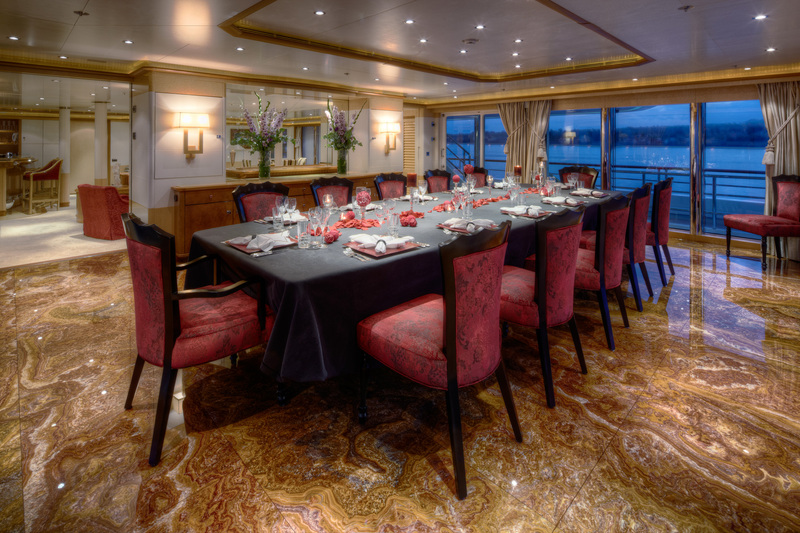 Audio Visual Equipment and Deck Facilities include: Panasonic Plasma TVs in all staterooms. 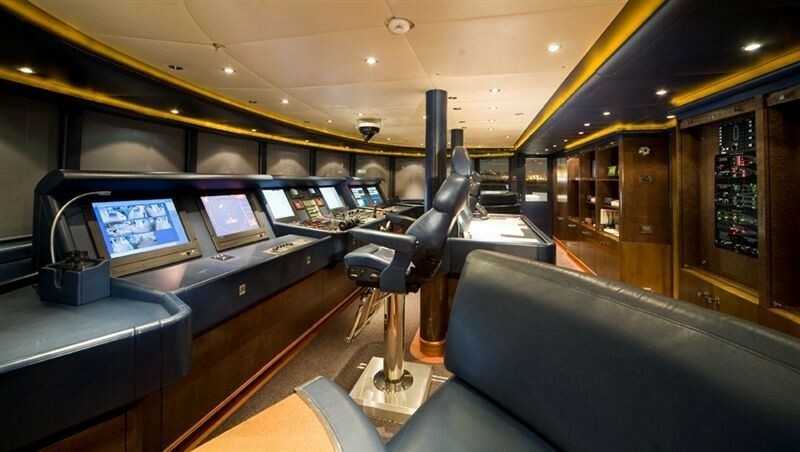 Lantic entertainment system consisting of 5 x 1 TB servers capable of storing over 15,000 audio songs and 750 DVD films. 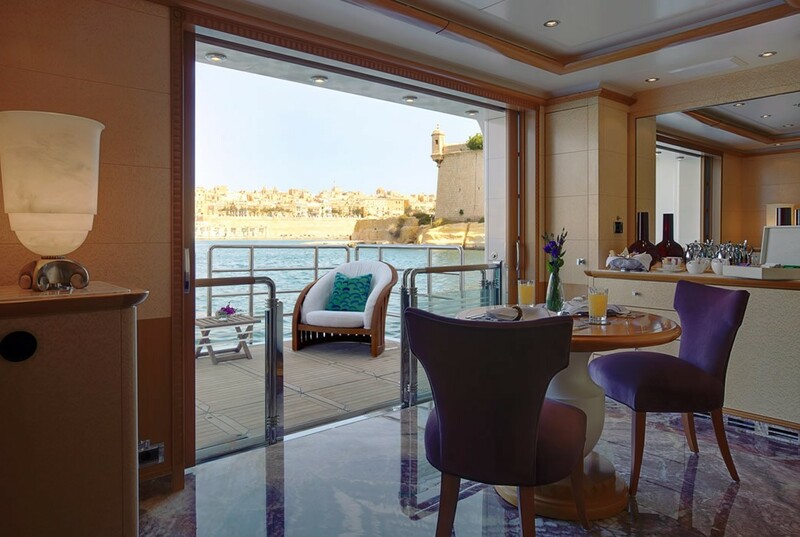 This system can be accessed from all guest staterooms with custom made remote controls or from PDAs onboard. 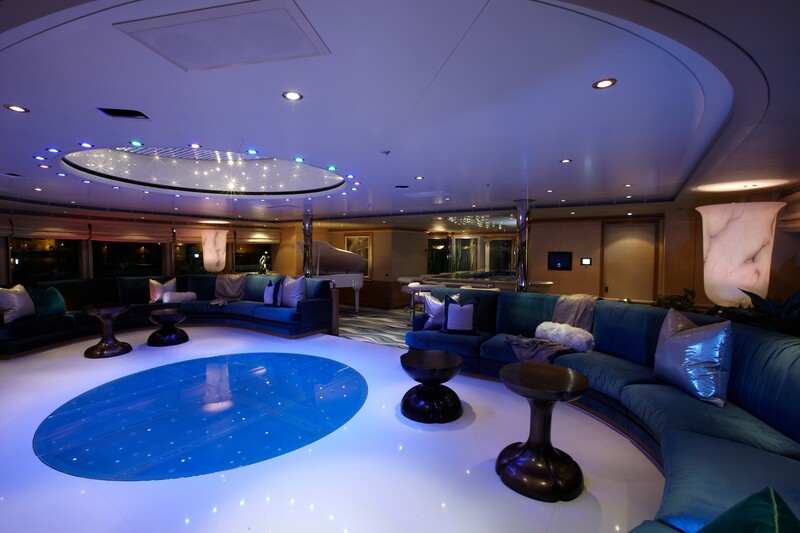 Seating for 13 guests in cinema on main deck. 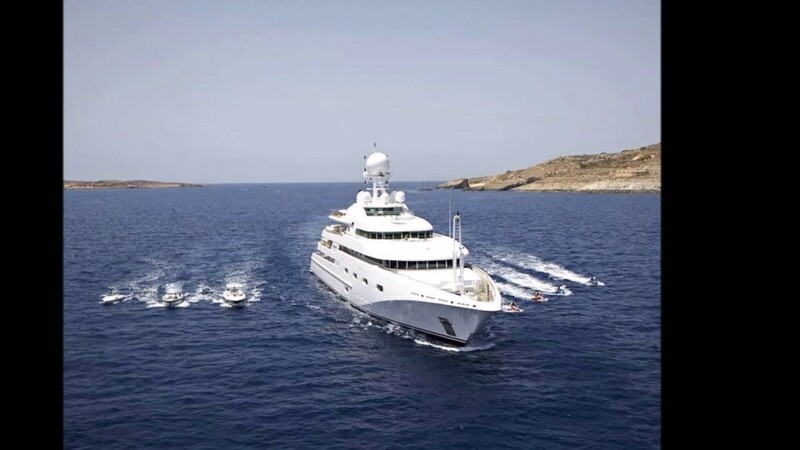 Communications include 2 x Nera F77 Inmarsat Fleet, Nera Mini-M, 2 x Furuno Felcom Sat-C, Seatel 4000 satphone, Furuno FS-1562-15 SSB, Furuno NX-500 Navtex, 3 x Furuno 2721 VHF, 12 x Icom IC-M1 h/h VHF, McMurdo 406 EPIRB, minimum 254kbts internet connection. 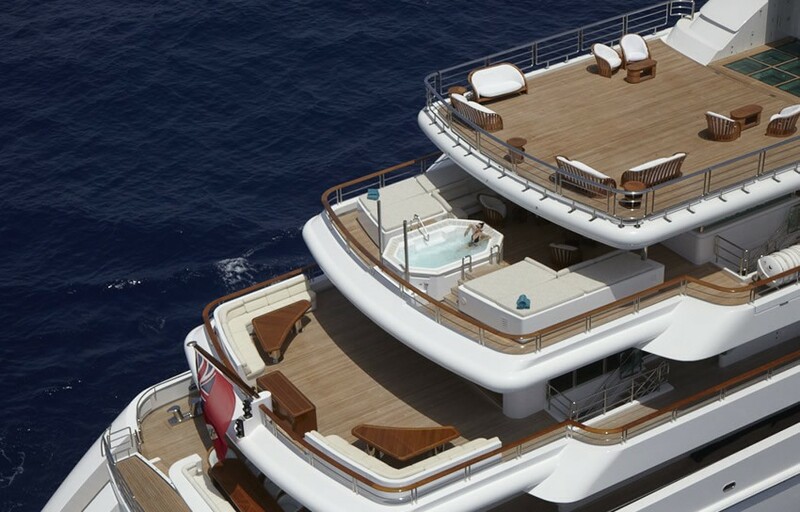 Details are thought to be reliable but are not guaranteed.